This review describes some of the technologies and tools available to support web-based collaboration. The focus is on systems available today and largely discusses commercial offerings. It does not give a detailed requirements analysis or discuss future and (many) research systems. A white paper produced for ARL -- http://new-npac.csit.fsu.edu/users/fox/documents/arlcollabwhitepapermay00/ -- gives a better discussion of requirements for ARL and has some brief description of research issues. These can also be found at the web page for this tutorial http://aspen.csit.fsu.edu/collabtools/ and at a report written for ERDC http://new-npac.csit.fsu.edu/users/fox/documents/generalportalmay00/. The first web page has not just this report but also a set of PowerPoint presentations containing both the overview and detailed description of individual technologies. Published papers on this subject can be found at http://new-npac.csit.fsu.edu/users/fox/documents/pajavaapril00/ (Proceedings of the Second International Conference on the Practical Application of Java, Editor Omer Rana, Manchester England April 12-14 2000) and http://www.new-npac.org/users/fox/documents/gempapermarch00 (Physics of Earthquakes" edited by John Rundle, Donald Turcotte and William Klein and published by AGU in 2000, pp 219-245). This work has benefited substantially from our own PET and NSF funded activities with the systems called Tango (synchronous collaboration) and the WebWisdom content manager and Virtual Classroom Manager in asynchronous collaboration. Recently several commercial synchronous tools -- WebEx Centra Placeware VNC and others (see sections 2 and 6) have become popular with more or less identical collaboration models, which are very similar to that in Tango. 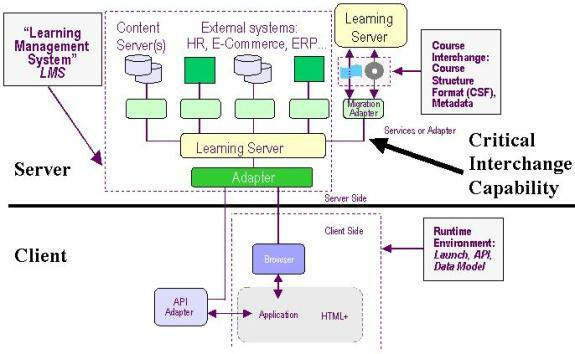 In the asynchronous area, we can learn from the commodity information portals like Yahoo, Excite, NetCenter while WebCT and Blackboard are asynchronous education portals described in section 3. there is perhaps more diversity here with different management and authoring styles producing a variety of tools. We wish to build web-based support for people to interact with each other and with other resources: computers, documents, and instruments. This was originally called a Collaboratory by Bill Wulf in a famous Science article in volume 261, 13 Aug 1993. We must do this while technology is rapidly changing and while we are not certain what collaborative tools, scientists will actually use i.e. the requirements are not known. In this review, we will cover a set of successful capabilities where some consensus exists as to what they do and how they look to users � these are typically (now) commercialized. There are also some clearly useful technologies and standards on which to build � we will cover some of these. Note that in developing an academic or government program in this area, we need to identify those areas where there is a potential requirement that industry will not provide (or render our solution invalid) in next year or so. These include special features of training, HPCC and science. Support of hand-held devices is so poorly understood that in spite of strong commercial interest, it remains a good research area. This review will make no recommendations. It will try to present without bias but incompletely a set of tools. We suggest that there are some pretty good solutions and that now is a reasonable time for groups to invest in learning and using some of the tools. Clearly capability, performance and robustness will improve but there seems to be consensus in several areas. We see time and money invested now will give groups a useful knowledge basis for using future systems. The original ARL white paper discussed the differences and similarities between support of training, administration and research. Any use of collaborative systems should take this into account in choosing what to do. For instance today, most commercial education systems emphasize asynchronous collaboration where the dominant business use (even in training) are the synchronous systems WebEx and Centra. 6) Support of HPCMO through a distributed PET team. 8) For a single user, �collaboration� between different input devices. This includes case where a scientist controls a specialized display with a PDA controller or a wheelchair shopper accessing the mall kiosk from a hand-held keyboard. See section 1.7 for further comments in this area. In the following subsection 1.2, we discuss some key base technology trends and approaches. 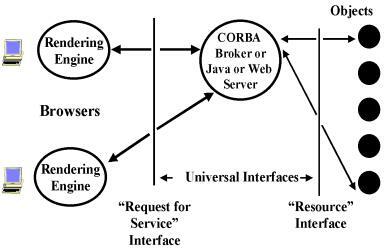 We believe that the Object Web should be the basis of any modern system; typically one programs in Java as it has best software engineering properties and defines interfaces and data structures in XML using a multi-tier architecture. There are some important Internet trends, which suggest where systems will go � these include the increasing bandwidth and latency of networks (Gilder�s law) and the growing use of Palmtop devices. Any electronic artifact is by definition an (distributed) Object whether it be an instrument delivering data, a computer, an online user, a computer program or even the most common object � the basic web page. 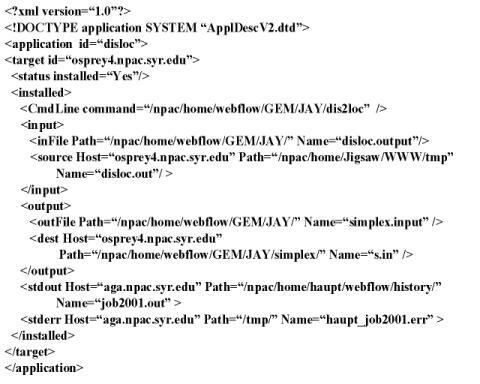 As shown in the figure below, even as objects are programmed in Java, their interfaces and the object metadata will be defined in XML. In the picture below, we show an example of a software object being defined in XML. As shown above, a multi-tier architecture separates objects (on right) from the middle-tier where brokers and collaboration servers lie and on the left clients. Note collaboration servers provide the illusion of the popular peer-to-peer architecture. Objects on one client appear to be reflected in the display of other clients; nearly always this is �just� done through the mediation of a server. Many application areas are currently setting XML based coarse grain object standards. One example is the work of IMS and ADL in the area of education and training (http://www.adlnet.org). We will not discuss these standards here in detail although the tutorial web site does have separate link (http://aspen.csit.fsu.edu/collabtools/imsadlieeejan01.html) discussing this and we briefly summarize the issues in section 1.6. This is definitely an important area but for instance the lack of agreement as to how to collaborate implies that the requirements of this capability are not included in the current IMS/ADL standards. Note using object technology is essential to allow powerful approaches to managing and providing services in a sustainable fashion that leverages the best available commercial� infrastructure. colorfully expresses this as the Telecosm eclipsing the Microcosm (the title of his earlier work on the CPU revolution). This observation says that the multi-server models needed for powerful collaboration will scale and in fact there could be a growing trend to more server side rather than client side computing. The network bandwidth will also support increasing multi-media content for conferencing and higher visual impact pages. This trend will enable growing use of PDA�s linked to the servers with the confluence of cell phone and personal digital assistant markets propelling new capabilities. It is predicted that by 2005, 60 million Internet ready cell phones will be sold each year and 65% of all broadband Internet accesses will be via non-desktop appliances. These observations motivate our interest in multi-device collaboration with PDA�s and desktop clients in the same sessions. 3) Shared resources i.e. shared objects, which can be documents, computer programs, data streams or visualizations.� The basic tools correspond to the special case where the shared object is a text message or simple drawing. The objects can be shared in several ways, which trade off ease of use versus flexibility versus ease of implementation. There are three object-sharing styles, which we will discuss in this review. 1) �True� shared event: actually all these methods are shared event but differ in the events being shared. This initial case corresponds to sharing the events defining state of object being shared. 3) Shared export: Convert (rendering of) object to some standard form that is more flexible than bitmap of shared display. Build a custom sharing for this exported form. The commercial WebEx system uses �a patented sharing of virtual printer� which is roughly equivalent to sharing export to PDF. �The area of collaborative visualization shown below can illustrate these choices. 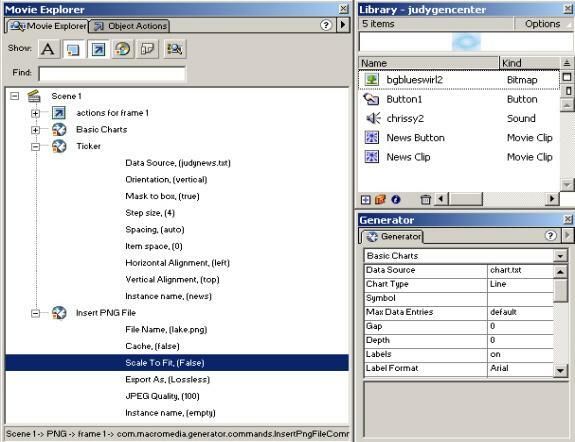 We have a master user B sharing with other users A and C. there is a visualization pipeline formed by the computer program (object on the left above) where its output and input wend their way through multiple filters (tiers) until they are finally rendered on the particular client device which could be different for each user. As shown above by vertical arrows, one can share �object� at any stage in pipeline. The simplest case (user C) is shared display when the final frame buffer is shared. The basic shared event collaboration shares the original object � perhaps replicating it but then exchanging state information. The user A has maximal flexibility as he or she can choose to use or ignore B�s visualization state change. In particular A has no need to use the same display device as B; B could be a high end CAVE, A on a PDA. Shared export corresponds to one of the intermediate arrows where one is inside the pipeline at a stage where the format is some standard such as HTML, PDF, Java2D or 3D, SVG (Scalable Vector Graphics). Then one can build a generally useable collaborative viewer for this intermediate form and produce a powerful environment in a re-usable fashion. The above figure illustrates why building collaboration systems is difficult. Even if we agree on what needs to be done i.e. in this build a shared visualization, there are many ways to do it and we can only find out what to do by building experimental systems and seeing how they are used. Finally if we share objects and we have a lot of them, then we must have management capabilities so we can store catalog and retrieve them. This management capability needs to be linked with the collaboration system and in some applications has special requirements like those to store grades and homework in learning systems. Now we discuss a critical distinction between synchronous (real-time) and asynchronous collaboration. Note that the Web is full of objects � Web pages sitting on Web servers � and these support asynchronous collaboration gotten when somebody posts a web page and later somebody else looks at it in their own time. One of the attractions of web-based collaboration is this incredibly simple but powerful asynchronous model. Note that by replacing a web document by a �CGI script� or servlet (web interface to program, database etc.) implies that the web supports general multi-tier object sharing. We can abstract this capability as the Publish/Subscribe mechanism shown above and make it more useful by adding some mechanism (automatic email, instant messenger or word of mouth) to tell the collaborating client when new information is posted. Adding synchronous collaboration to this model �just� involves providing �real-time� notification and automatic update for changed objects. Of course this is not easy to do reliably and conveniently. In sections 2 and 6, we give a detailed and reasonably complete survey of the major synchronous collaboration tools. Sections 1.6 and 3 highlights the two major asynchronous tools for education: WebCT and Blackboard. 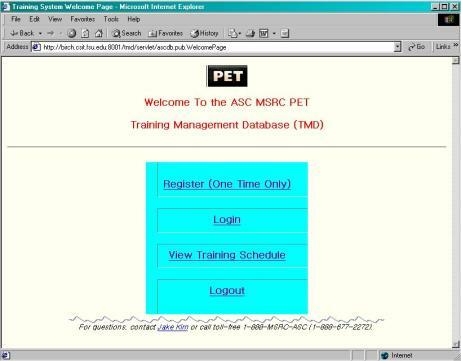 Section 9 covers a focused system TMD produced for ASC by the PET program. Sections 1.5, 4 and 5 cover the critical area of audio-video conferencing. Section 7 reviews instant messengers � a popular component of collaboration, which are similar in function to text chat rooms. Section 8 covers an asynchronous module of importance � namely calendars and scheduling systems. Note that in both messengers and calendars there are emerging standards which will enable the interoperability of these capabilities between different systems. We have discussed how collaborative services depend on the nature of the object being shared. For a shared Web page, the object is authored in some fashion or other. This can be Word, PowerPoint, a native HTML editor or a high end possibly multimedia page produced with Macromedia or Adobe tools. We expect that sophisticated web pages will grow in importance especially in areas like education where collaboration technology can increase competition and the potential audience. Market pressures will demand that providers provide the best possible learning environments.� In section 11, we review Macromedia technologies where Flash and Shockwave are perhaps the most popular high-end authoring systems. The current tools are not well tuned for education where one needs to make a lot of similar pages, which can be easily updated to take account of changing curricula in rapidly evolving fields like computer science. We expect that the situation will improve as powerful XML based systems using XSLT style sheets become available; here it is interesting that Macromedia has acquired Allaire and its leading database driven template system Cold Fusion. Authoring style is important for collaboration systems as good sharing is obviously harder for the more complex web pages produced using Flash and other such technologies � for instance one needs not just to share the page but also the interactive controls. Here there are several important developments in the Web Consortium W3C standards community (http://www.w3c.org). The W3C Document Object Model or DOM defines precisely the object structure of W3C compliant Web pages. The DOM definition is only just being completed with the key (for collaboration) event characteristics coming out in the level 2 and 3 W3C DOM specifications. This should alleviate the well-known difficulties coming from the very different DOM implementations in Microsoft and Netscape browsers. Unfortunately at the moment, no browsers support the latest standards and with an 87% market share, Internet Explorer is not tracking these changes actively. The Netscape 6 browser was recently released but it still too immature for serious work although it does have excellent W3C standards compliance � even here it only supports level 1 of the DOM at this stage. Section 11.7 notes the possible importance of SVG � the W3C Scalable two-dimensional Vector Graphics standard. Adobe illustrator can already export to this format and Flash has an open format with a prototype SVG converter available from the University of Nottingham. PowerPoint can also be converted to this syntax although the current Office 2000 exports to VML � Vector Markup Language that was a precursor of SVG. SVG is important for any 2D visualization and scientific whiteboards � we are using it for the whiteboard available with our Gateway portal (section 10). We believe both the authoring and visualization community should study SVG. It could be very important for interoperability. There are several other important standards that affect authoring. MathML is the new standard for mathematics; SMIL is a complete syntax for incorporating multimedia into web pages; OpenOffice (http://www.openoffice.org) is Sun�s effort (through their StarOffice product) to define standards for productivity tools; WML is potentially important for content aimed at wireless devices. The W3C also has a major effort in universal access that should be tracked. We are in a transition time with many important developments that will eventually enable sophisticated pages to be manipulated and shared in standard fashion. We see that now is a reasonable time to explore use of technologies like Flash as it is now clear how they will escape their current proprietary base and so investment in such material will have a long-term future. �In our experience with the use of Tango in distance training, audio-video conferencing was always problematical and the area most likely to lower the quality of the session. The essential problem is audio for this requires negligible bandwidth (a few kilobits per second) but high quality of service as the human ear is very sensitive to audio distortion. The current Internet does not support quality of service � one must �buy it� with bandwidth and hope that the packets get through. In the case of video, there is less of a problem for although the bandwidth needed is higher than for audio, the eye is much more forgiving of broken images especially if these are �just postage stamp talking heads�. Quality of service is less critical for video. Remember that we transmit the curricula material separately from the multi-media and this will always be high quality. In section 4 we describe the HearMe approach to desktop audio. This is a low-end solution that enables an arbitrary mix of conventional phones and Internet audio streams to participate in a conference. All sources are digitized for later replay. It is ironic that conventional telephones have both quality of service and handsets with echo cancellation; they tend to outperform Internet solutions. This audio supports the G.723 (modem) and higher quality G.711 standard codecs. In section 5, we describe the radically different approach of Argonne/NCSA�s Access-Grid technology aimed at large rooms linked by high quality networks. This system supports multiple high-quality audio and video streams and each client needs 20 megabits per second network bandwidth. We see this as the premier high-end system aimed at a rather different model than HearMe; the Access Grid supports interacting communities whereas HearMe is aimed at the classic collaborating desktop scenario. We note that in the desktop case, the value of postage stamp video is not clear. The much richer Access Grid video has clear value but is only possible on high speed� networks and with significant technical support. We need to review available desktop video solutions and we have not completed this task yet. We note that the multi-media codecs used in conferencing are different from those optimized for Webcasts and streaming multi-media. The latter need not support interactive exchanges and can use much larger client side buffers (several seconds) with corresponding improved fault tolerance. We are building a converter to translate the archived �voice objects� in HearMe from G.711/723 to RealAudio format for better playback. One important issue is interoperability and there are two important standards H.323 and SIP described in section 12. Currently the Access Grid does not support these standards, which is in our opinion a weakness although there are ad-hoc methods to tie non Access Grid (AG) clients into an AG session. 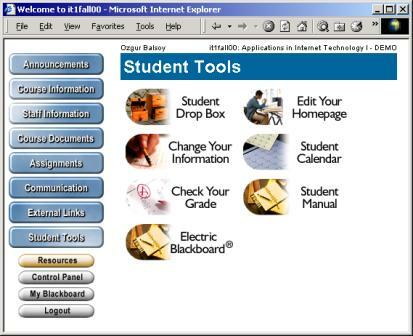 The client server interface is used to define �learning object� standards by IMS (http://www.imsproject.org) and ADL(http://www.adlnet.org) in the educational and DoD training communities respectively. Interestingly these efforts use the rather dated client server model rather than the modern multi-tier architecture adopted in state of the art systems. Nevertheless these standards are important as the certainly identify key features of learning objects even as we think more experience will be needed before sustainable standards can be agreed. We surely are at the beginning of the era of distributed and distance learning and must expect substantial experimentation before agreed approaches and standards emerge. In the picture below, we show a fragment of the DoD SCORM standard for course material. Highlights include a recursive hierarchy (defined by the block and leaf au attributes) and education specific attributes including prerequisites, completion requirements and course objectives. 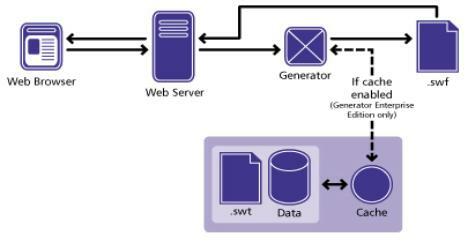 This diagram shows a typical display of an object structure produced by modern XML tools. As an aside note, we believe that the recent introduction of XML Schema will greatly help this type of work as they are a much more powerful object specification methodology than the previous DTD syntax. Following the general SCORM learning object structure, we show a sample given by ADL of a military training example. Note that these standards go down to the �Web Page� as the basic unit and so provide specification that can help decide what material to share but does not address the nature of the sharing. The W3C DOM can take over and used to define the collaboration of Web Pages and their internal document fragments. We consider object standards critical for collaboration as you can only effectively share information if you enough to specify its access and internal structure. �The current standards include metadata originally developed by IEEE, which are aimed at defining the properties of educational objects thought of as "documents" (author, title etc.) with as shown in figure additional packaging standards on how to form lectures, modules, courses, degrees etc. from the basic curricula units. IMS has a major effort to define tests and quizzes but it seems that this may be too much detail in an area still being developed. For instance the clever CAPA system for personalized questions (http://capa4.lite.msu.edu/capa-bin/class.html) is not currently supported. Nevertheless the issues raised in these test and quiz standards will always be important and used in future work. IMS also includes enterprise properties (such as standards for personal information), which must be important. It is interesting that WebCT and Blackboard are popular with educational institutions given their limitations in terms of authoring model and collaboration capabilities. One reason is that they provide a model suitable for the less experienced user with limited online authoring skills. We doubt if this can be a long-term rationale as we believe that there will be growing pressure for the highest quality learning environments and more emphasis on high end authoring. In many areas one needs laboratories � both say in physics but more relevantly for DoD computer science needs programming laboratories. In our distances classes with Jackson State we used the rather old Virtual Programming Laboratory VPL (http://old-npac.csit.fsu.edu/projects/VPL/vpl-publications.html) which was quite effective. This area deserves more attention. One concern with the systems of section 3 is the realism of their goal of providing a �complete solution�. With rapidly changing technology and even requirements as users experiment with new systems, a modular approach could be more sustainable. For instance Balsoy and Sen (http://aspen.csit.fsu.edu/collabtools/senthesisdraft.html) produced an effective system to support registration, grading and homework submission. We do not review this here as we don�t see these capabilities as critical in training applications. Rather in section 9, we describe a module produced for ASC to aid registration. 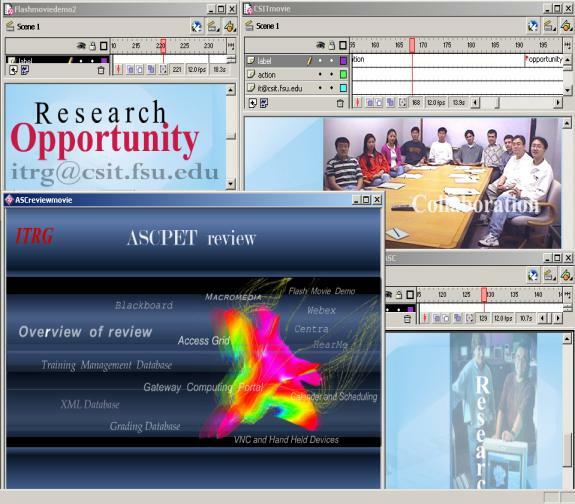 One can find a discussion of the larger system online (http://aspen.csit.fsu.edu/collabtools/gradingjan01.html). 1) What will be the connectivity of PDA's to the "wireless web". Here both hardware and software issues are unclear. 2) One can expect lowish modem speeds for pervasive access (14.4 kbaud is current digital cell phone access speed). However existing 802.11 and the emerging Bluetooth protocols will enable much faster access in selected areas like research laboratories. 3) There is still debate whether the authoring model for PDA's is a specialized format (WAP, WML) or just appropriately designed HTTP/HTML. 4) What are the important PDA applications? These include job submission in the computing arena and note taking, quizzes etc. in education. One area we have investigated is the use of PDA�s to control large screen displays and we see this as quite promising with a typical scenario shown below. 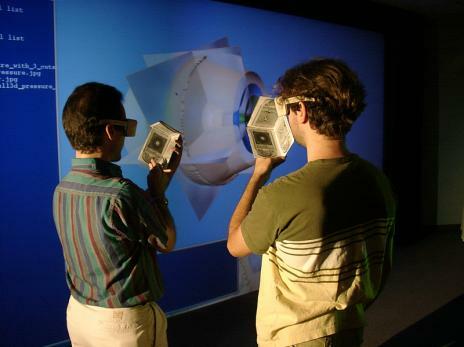 Here three linked PDA�s show the 2D slices while the researchers look at the large 3D stereo display controlled by movement of the PDA. As discussed earlier, such systems are naturally built on top of collaboration infrastructure. In section 10, we include brief discussions of two computing portals. The Grid Forum in which we are participating is producing a more substantial survey. (http://www.computingportals.org). Sites like Yahoo first popularized portals but recently they are being applied to Enterprise information systems as discussed in a report by Merrill Lynch. This forecast a growth in this software area up to some $15B per year in 2002 as shown in the first figure of this subsection. As shown above, we see computing and education portals being built on top of infrastructure designed for commodity and information portals. As these commercial activities are still developing rapidly one must expect a significant amount of experimentation needed until �we get it right�. 4) Contact colleagues in real-time (audio/video conferencing) or asynchronously (email etc.). So collaboration is viewed as a portal service as detailed below. This requires we look at computing specific objects (visualization, job submission forms) and build collaborative support for them. The science base also requires we support MathML and other technologies specific to the field. We show below the resultant view one gets � here for an earthquake science computing portal. 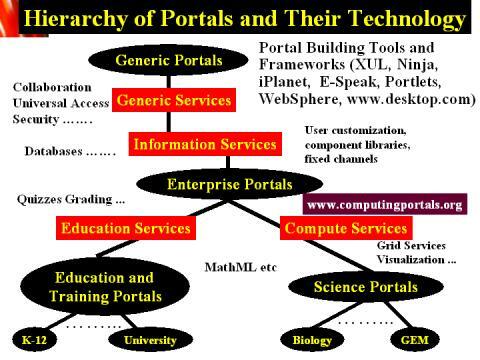 Important capabilities (services) of a computing portal include. Web conferencing tools are trying to create a virtual meeting environment similar to real world seminar rooms. In this case, attendees are at their desktops with an Internet connection during meetings, instead of being at the same room. The presenter can do a power point slide show, ask some questions through chat and get the answers from audience, annotate on the slides, write and draw pictures on a blackboard, and demo an application during a virtual meeting. Audience can either ask questions by talking when given the permission or through the chat. The voice is transmitted either through Internet or using teleconferencing. Some conferencing tools also provide video streaming. There are a lot of web conferencing tools on the market today with varying capabilities. In this paper we evaluated some of the most important ones. We have two independent evaluations of WebEx. The pictures below show the rather similar interfaces that have evolved in the leading systems: Centra, WebEx and Placeware. � October 19 2000: WebEx Communications, Inc. the leader in communications infrastructure for Web meetings today announced record results for its third quarter, ending September 2000. WebEx added more than 700 new customers this quarter, bringing the total number of customers to more than 1800. � During the third quarter, AT&T and Global Crossing announced the integration of WebEx services into their communications solutions, and Commerce One announced that WebEx services have been integrated into their next generation Commerce One.netTM. WebEx's list of new customers this quarter contains industry leaders in aerospace, automotive, computer software, computer hardware, consulting services, financial services, healthcare, real estate and legal services. New customers include 3-M, Aberdeen Group, Ace Hardware, Altera, Associated General Contractors (ACG), BancTec Inc., Blue Martini, Briggs & Stratton, Brown Brothers Harriman & Co., CheckFree Corp., Cosine Communications, Emory University, Enron Energy Info Solutions, Fiserve, Inc., FleetBoston Financial, Forrester Research, Grubb & Ellis, Hewlett-Packard, Keystone Solutions, Kyocera Wireless Corp., Medtronic, Motorola, NEC America, Nexprise, Proxicom, Razorfish, Sunguard, Toyota Motors, Wilson Sonsini Goodrich & Rosati, ZDNet and Ziff-Davis among others. � Oct. 12, 2000-- Centra the world's leading provider of software infrastructure and ASP services for live eLearning and Internet business collaboration, today announced results for the third quarter and nine months ended September 30, 2000. � The selection of Centra by Andersen Consulting, one of the world's largest professional services firms, as the company's standard infrastructure for the delivery of live eLearning to the company's 65,000 employees. � A significant initial deployment at Coca-Cola Company, the world's largest soft drink provider with over 35,000 employees, to provide eLearning delivery infrastructure for global SAP end user training and ongoing change management initiatives. � Siemens AG selected Centra as the corporate eLearning and collaboration standard to support communications and planning among the company's top 1,500 global operations executives. In addition, Siemens, which operates in over 190 countries, will use Centra to support their extensive SAP rollout through hands-on end user training over the Internet. Synchronous Virtual Environments are offered by WebEx Centra Placeware Latitude and NetMeeting featuring shared display and shared export (for PowerPoint). These systems have limited but nontrivial functionality in the areas of archiving, export models, management and PDA support. In the descriptions below, some of the capabilities have not been examined deeply � sometimes because they were not available in �free service� we used. VNC offers a public domain shared display capability described in section 6 in comparison with that of WebEx. Note that VNC was designed for a �different problem� � a systems czar doing administration on multiple remote machines i.e. the master computer viewing display of (single) client. It has not been optimized for one master display being shared with many clients as needed in distance training. Note customer help desk support (including remote consulting for the MSRC�s) needs the first model where the master computer views the client display. Further this case typically one only has a few session members � perhaps even just two. In both shared export and shared display capabilities of the reviewed systems, there is built in support for annotation. Note the importance here of sharing objects with scalable displays. Then one can place the annotation in the correct place on each client display whether or not they are each viewing at the same magnification. PDF and SVG are scalable in this sense as is a fixed format like a shared frame-buffer or a GIF/JPEG export. HTML is not scalable as different browsers can lay out the same page in different ways that do not preserve relative positioning. All systems have some sort of chat and whiteboard tools and Audio/Video conferencing. Centra has a built in Windows audio with a Java front end. WebEx currently uses a product from Lipstream, which has similar structure to the HearMe system described in section 4. 1. 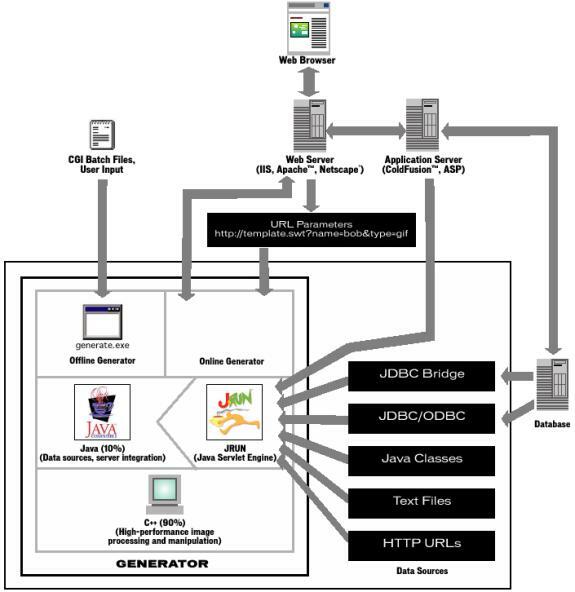 Capabilities: The Centra 99 server supports the Symposium client--a Java application that works with a Web browser--and the browser-based Conference client. Symposium is designed for collaborative, hands-on training via application sharing, while Conference is for presenting information with limited interaction. Conference participants can only view applications shared by a Conference leader, whereas Symposium provides control for both session leaders and participants. PowerPoint Presentation: Centra's web safari tool allows the session leader to take the participants on a synchronized Web tour. Participants can see the leader's "pointer" and will automatically scroll when the leader scrolls up and down on a Web page. Using Conference, PowerPoint presentations can be uploaded to the server for display and slides can be annotated with drawings and highlights. Participants can send questions to the presenter using text chat. A session leader can choose an area of a screen to broadcast to participants. 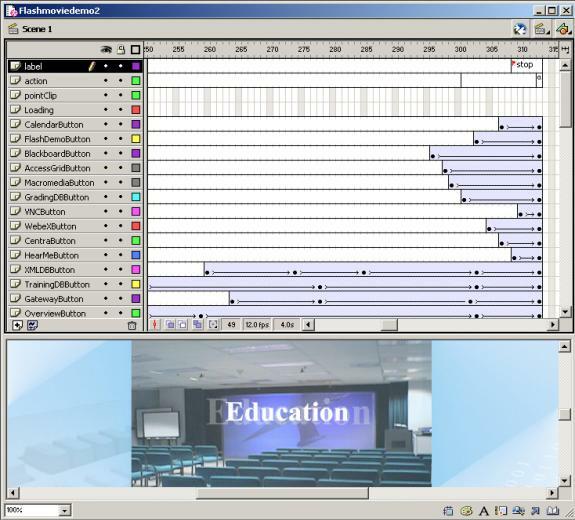 Rather than sending a continuous stream, Conference's screen broadcasting tool refreshes a participant's screen at a user-selectable interval. Symposium combines embedded PowerPoint presentations, integrated audio, whiteboards, application sharing and collaborative Web surfing. All of them are controlled by instructors. The instructors determine which students can present to the rest of the class. CentraNow does not preserve PowerPoint transitions or animation effects, supply a whiteboard, conduct Web tours, or offer robust annotation tools. Polling consists of simple yes/no voting. Presenters have access to a window that can simultaneously capture and broadcast their screens, but true collaboration isn't possible. The presenter must have PowerPoint installed, because the conversion from the PPT format to GIF images is done locally. Since CentraNow does not cache slides, images can take long to download over a dial-up connection. Centra's Agenda Builder: Content for Symposium or Conference can be built ahead using Centra's Agenda Builder, which supports multimedia files. Multimedia files can be pre-recorded video clips, audio clips, animated GIFs and other multimedia content. Instructors can build Web-based evaluation forms and assemble event content into a structured, customized format. Files with the following file extensions can be inserted : .txt, .html,.htm, .gif, .jpg, .jpeg, .avi, .mov, .qt, .mpg, .mp2, .wav, .au, .rpm,.ram, .ra, .rm, .asf, .ppt. Centra Conference supports .ppt, .gif, and .jpg files. 2. Audio/Video Conferencing: High-quality audio. Centra Symposium: Fully integrated, multi-way, full duplex IP audio conferencing. IP Video Conferencing is real-time, multi-point video conferencing. An adaptive video bandwidth feature ensures the highest possible performance over connections as low as 28.8 kbps. Centra Conference/eMeeting/CentraNow: Integrated voice over IP. Each user has a built-in audio wizard to ensure high-quality audio optimization. 3. Shared Export: Power point slides are shared with the audience. The presenter has the control on the slide but if a listener gets the permission to ask the question he can highlight, draw or put some balls on the slide. Co-presenters can upload their own PowerPoint presentations on the fly, even after the session has begun. 4. Shared Display: Leaders and participants can share any Windows application, including their entire desktop or even a remote server. It can deliver applications in three different ways to participant desktops - group interactive, individual hands-on labs, and broadcast - from any PC over low-bandwidth network connections. 5. Archive: Centra has recording feature. Live sessions can be recorded. Recordings can be editted frame-by-frame, over-dub the audio track and also transition effects can be added. Also events can be configured to allow enrolled participants access to event content before and after the live session. 7. Chat Room/Instant Messenger: Attendees can send instant messages publicly or privately. Text Chat can be used before, during and after a session. Also Text Chat can be used during a Breakout session and while using other tools such as the Whiteboard or the AppShare tool. Public Text Chat cannot be used during a Symposium Auditorium Event. 8. Quiz /Polling (Conference/eMeeting/CentraNow) yes/no polling is available. $25,000 for the software, $200/seat; annual maintenance fee of 18% of original cost and additional fees for hosted Web service. 10. Number of participants: A maximum of 250 simultaneous users can be handled, but for full interactivity 25 users is the maximum. 1. 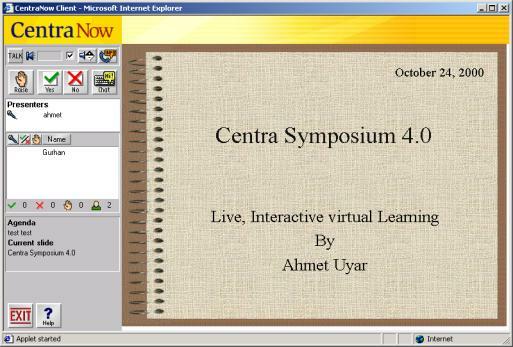 Capabilities:� Centra Symposium is basically designed to do presentations over the Internet. It is one of the four products Centra Software, Inc provides for conferencing over the Internet. It is the latest released and most capable one. The other products are Centra Conference 3.0, Centra eMeeting 3.0, and CentraNow. There are two types of people in a conference room in Centra conferencing products. One is the presenter and the rest is the audience. But it is possible to assign some people from the audience as co-presenters, and they get the same privileges as the presenter except the right to assign co-presenters as listeners. Presenter sets up a meeting and a meeting ID is generated, then presenter invites the listeners to the meeting by email. Listeners can attend the meeting with the meeting ID. The presenter has full control over the presentation. Normally presenter talks and the audience listen, when a listener wants to ask a question, s/he raise her/his hand and when the presenter gives permission, s/he get the microphone. On the other hand it is always possible to ask questions through sending a text message. A user can send a text message to everyone anytime s/he wants. Any time the presenter can import a power point file to show others. Both the presenter and listeners have an applet running in their machine. The presenter can import a power point file into the presentation and has full control over the presentation. Listeners listen the talk and they can raise a hand when they want to ask a question, they can also send a text message to anyone anytime. They can also answer some questions with yes or no. They can respond to a poll with choosing from a multiple-choice question. 2. Audio-Video Conferencing: Centra Symposium 4.0 provides multi-way, full-duplex IP audio conferencing. It also provides video conferencing. 3. Shared export: Only Power point files are supported. Power point slides are converted to gif images (640*480 pixels). No resizing and zooming are allowed. Audience can annotate on slides when they get the microphone to speak. Since the size of slides is fixed, annotations work quite well, no pointer problems. 4. Shared Display: Presenter or co-presenter can share applications running on their desktops or their entire desktop. The images of shared application are sent to participants regularly. The quality of shared display is not so good; clients cannot see the actions taken by presenter immediately. For example, if presenter scrolls down the shared application, it takes a while to get the new image completely and client observes some texts or images on one another in the transition phase. No annotation is allowed while sharing an application. There is no fixed size for applications being shared, Presenter can resize the window on his own will. Participants see the shared application in its original size if they choose expand view option. No resizing of shared application by participants is allowed. Remote Control: CentraNow does not provide a mechanism to pass the control of a shared application to a remote participant. But any participant can share an application provided that he is assigned as co-presenter. 5. Shared Web Browsers: Centra does not support Shared Web Browsers. Web page sharing is achieved by shared display. 6. Archive: Centra has developed a recording engine, Centra Recorder, and an editing engine, Centra Producer, to record and edit conferences. But I did not have any chance of testing it. 7. Whiteboard: A whiteboard is provided. 8. Chat Room/Instant Messenger: An instant messenger is provided. In addition, the presenter can divide the listeners into subgroups and they can communicate with each other privately. 9. Quiz/Polling: Presenter can design a multiple choice or yes/no question on the fly and get the answers instantly. 11. Number of participants: Up to 250 simultaneous users. 12. Requirements: Clients do need to have a web browser and a microphone and speakers. Servers need to have Windows NT 4.0 with SP4+. On the presenter machine it requires Microsoft Power Point to import the power point slides. The Microsoft Power Point is not required on the client machines. They only need to have a java capable web browser with a microphone and speakers. 13. Need for further development of Tool to be useful: It seems that it is a complete product for web conferencing. On the other hand, it lacks some important features. It is not possible to resize the client window, no zoom in or zoom out. 13. 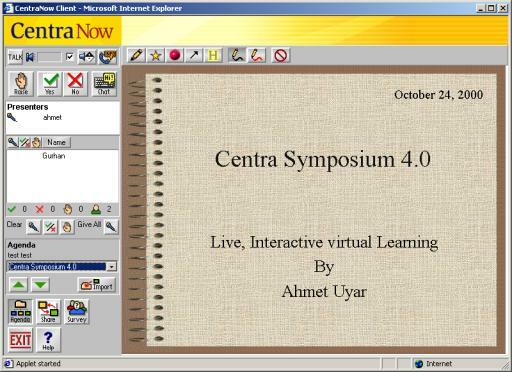 Experience in using it: I did not have a chance to test Centra Symposium 4.0. But We successfully used CentraNow, which is a less capable and less expensive product, to do a web conferencing to Mississippi from Florida. 1. Capabilities: WebEx is an online meeting system with a meeting host and presenters. WebEx allows parties to share or present any application, including presentations, webpages, documents, whiteboards, or entire computer desktops. It integrates live audio and video into the meeting, in addition to text chat and polling features. WebEx has launched four services -- WebEx Meeting Center, WebEx Business Exchange, WebEx On-Call and WebEx Shopping Together. WebEx's services enable end-users to spontaneously share content and applications in a seamless environment with integrated audio and video. End-users access the interactive services through the co-branded websites of WebEx customers and partners as well as the WebEx website. End-users can participate in meetings from anywhere on the Internet using a standard web browser. Annotations: The host and presenter always have annotation privileges. All attendees who have annotation privileges can annotate documents using the tools in the toolbar. Everyone's annotations appear on all attendee's monitors. 1. Pointer Icon: changes the pointer to a pointing hand. The Pointer includes the name of the person pointing. 2. Text Tool Icon: the pointer changes to an I-beam, allowing you to annotate a presentation or document with text. 3. High Light Icon: the Draw palette appears, with the highlighter tool selected by default. The pointer changes to a highlighter, allowing you to highlight specific areas of a presentation or document. 4. Drawing Icon: in the Draw palette, the pointer changes to a pencil. Other drawing tools are straight line, an ellipse, a rectangle, a line that terminates with an arrow, a line that begins and terminates with arrows, a checkmark, and an X-mark. 5. Cut Annotation Icon: the pointer changes to a pair of scissors. Then click an annotation to remove it. 6. Zoom Icon: zoom in or out properties on a presentation or document. 7. Thumbnail Icon: display thumbnail representations of all the pages of a presentation or document. 9. Synchronize Icon: synchronizes the page view for all attendees and ensures that all attendees are viewing the same page. 10. Previous Page Icon go to previous page. 11. Next Page Icon: go to next page. 2. Audio-Video Conferencing: WebEx provides a set of APIs that enable telecommunication providers to integrate WebEx online services into their offerings to provide integrated scheduling of audio and data conferencing. All WebEx Services accessed via APIs are co-branded for the telecommunication provider. During a meeting, there are two options for conducting a conference; internet voice or teleconference. Internet voice utilizes IP connection and is available in free WebEx meetings. Teleconferencing utilizes the phone system and is available in Pay-Per-Use meetings. There two calling options in WebEx teleconferencing; Call-out and Call-in. The Call-out option enables the WebEx server to call each attendee. When an attendee joins a call-out enabled meeting, he enters his phone number. The server dials this number and connects the attendee to the conference call. The Call-in option indicates that attendees call in. After scheduling the meeting, each invited attendee receives an e-mail notification that includes the number they are to dial. After joining the meeting, the attendee dials the specified number and joins the conference call. 3. Shared Export: WebEx uses vector based imaging to share documents. The documents shared by WebEx is not limited to power point slides, any printable document can be shared including CAD drawings, blueprints, network diagrams etc. WebEx also enables resizing of shared documents while preserving the image quality. So participants can zoom in or out their documents on their own will while the presenter is using another size. Annotations work perfectly well in all cases. I did not observe any pointer problem in different sizes. 4. Shared Display: Presenter or anyone from audience if given the permission can share any application with others. The images of shared application are sent to audience regularly. But only those portions of the screen that have changed are transmitted to participants. Audience cannot resize the shared application window. Presenter or someone from audience, if given the permission, can annotate (only draw curves, no other annotations supported) on shared applications. This is unique to WebEx, they hold the patent of this technology. Although in general it works quite well, once when I tested it, it did not work well. I drawn some curves on the application on presenter side, but no curves appeared on the participant window. Sometimes I have experienced a color disorder problem when using WebEx shared display. Some part of the shared application was not updated correctly at the participant views. Background color is shown as the color of some part of the application. Remote Control: Presenter can pass the control of shared application to anyone from audience. One person can control the application at a time, either the presenter or the selected person from the audience. When there is the color mapping problems on shared application, the person has the control cannot see the menu items and other control tools properly resulting in a very bad situation. 5. Shared Web Browsers: WebEx does not provide Shared Web Browsers capability; instead it uses shared display to achieve the same result. 5. Archive: WebEx Record & Playback captures any application, including presentations, software demos, and even WebEx meetings, with synchronized voice recording (in order to capture the audio portion, an additional telephone / soundcard adapter is required). These recordings are saved as a local file and can be placed on your LAN or on your website. All annotations, shared display and whiteboard discussions are recorded and replayed during the playback in the order they occurred. 6. Whiteboard: WebEx supports whiteboards. 7. Chat Room/Instant Messenger: An online chat session can be conducted with everyone in the meeting, or one-on-one in a private chat. WebEx provides instant messages. 8. Quiz/Polling: It is possible to design questions on the fly and get the answers from the attendees. 9. Cost: The free meetings offered at WebEx.com are limited to 4 people per meeting. The application-sharing feature is limited to 10 minutes. Pay-Per-Use meetings are priced on a per participant, per minute basis. The current rate is $0.35/minute per user with additional charges for teleconferencing. 2. Call-in Teleconferencing: 5� per minute per participant. 3. Call-out Teleconferencing: 15� per minute per participant. 10. Number of participants: WebEx Meeting Center, WebEx Business Exchange support an unlimited number of participants. 11. Requirements: There are basically two versions of WebEx - the Native client, and the Java client. The Native client provides full/faster access to WebEx features (including host and presenter capabilities, zoom, video and call-out teleconferencing). The Java client is available to users whose browsers support Java 1.1 and wish to join a meeting without downloading the software. Also, this is currently the only option for users with Mac and UNIX machines. Native clients are currently under development for these platforms. 1. Capabilities: WebEx provides web-meeting tool using simple web browser. Not like most of sophisticate collaboration tools, meeting attendee does not have to install application before participating meeting. Meeting participants will get everything needed, when they connect to WebEx meeting site using ActiveX technology. Desktop / Presentation / Application / Web Sharing helps presentation or education. WebEx can be easy solution for small distance learning. 3. Shared Export: Most of Microsoft Office files, pdf files, and Image files. 4. Shared Display: It has a very impressive application sharing capability, it is stable and fast. It is possible to share any windows application. It is also possible to share entire desktop. In addition, it provides file transfer facility. 5. Archive: It allows recording of meetings for later playback. 6. Whiteboard: A whiteboard is provided. Annotations are always available. 7. 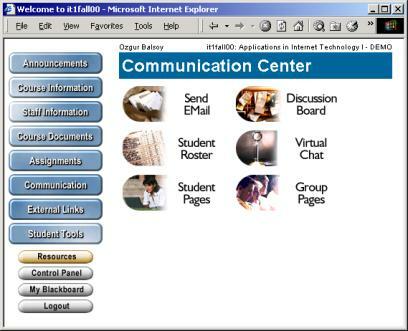 Chat Room/Instant Messenger: It is possible to send instant messages to the presenter or other listeners at any time. 8. Quiz / Polling: Presenter can design a question and get answer on the fly. 10. Number of participants: No limit. 56k Internet connection and over. 12. Experience in using it: The participation to WebEx Live demo session for made by both WebEx meeting site and Teleconferencing. The environment that I have is Windows 2000 with I Explorer 5.5 and T1 connection. Every function was working fine except Sharing Desktop, it is little bit of slower (But not much) than I expected. The presentation of all types of documents uses not an original document but it uses images. The source program opens in the background. WebEx uses the Active Touch Document Loader to display the selected file in the meeting window for all attendees to see. This is good for two reasons. One is reduce the traffic, because not the document itself, but images are transfer through Internet. Two is that with the same reason, we can prevent the damage of original document. Shared application has a shared button over the top, which can control privilege. One good thing is that during application sharing the contents of the window are dynamic. WebEx Meeting Center (which is host service) incrementally updates only those portions of the screen that have changed. Furthermore the updates are transmitted as vector graphics commands and not as bit maps. One more thing to help traffic control, even it uses HTTP protocols, is that it first checks whether TCP protocol is available. If it is, it uses TCP, since it lower the traffic. The price is the problem. Assume you have an hour class of five students, the whole cost per class will be $126 (6 person * 60 minutes * $.35). It is not expensive class but not a cheap one too. 1. Capabilities: PlaceWare Conference Center 2000 is a real-time web conferencing tool with up to 2500 live connections. It allows full audience polling, Q&A sessions, chat, panel presentations with multiple presenters. It requires telephone lines for the voice. At a designated time, participants call into a central location, logon to a password-protected area in the PlaceWare site, and wait for the moderator to begin. PlaceWare Meeting Center 2000 is a web meeting solution for a department or an entire corporation of departments. It designates an individual virtual office for everyone in the department in order to stay in touch more effectively with customers, clients, vendors and key partners. MyPlaceWare limits the number of attendees to five but has nearly all the functions of PlaceWare Conference Center. Select a slide set and present individual slides. Maintain slide sets. Such as renaming a set, saving a set, deleting a slide set, and so on. Generate new slides �on the fly.� i.e.,White Board, Editable Text Slide, and so on. Present a live product demonstration. Demonstrate a new software application, show the real-time manipulation of data in a spreadsheet, or lead the audience through a new process. Audience members can submit a question or comment from the Audience Consol. The presenter can monitor and respond to questions. The presenter can keep track of which questions reviewed by marking the question with a check mark. He can choose to display all questions or only marked ones. If a question or comment is inappropriate, he can immediately dismiss it. 1. Drawing tools: Draw straight lines and scribbles on the displayed image slide. i.e., to circle text or to point to a significant feature on a slide. 2. Stamp tools: Add a stamp, such as an X or check mark. i.e., to check off each bulleted item as it is discussed. 3. Text tool: Type text on a slide. 5. A pointer: Used to lead the audience from one part of the slide to the other. 2. Audio/Video conferencing: No video streaming is supported. No voice over IP is supported. Teleconferencing must be used for voice communication. 3. Shared export: Only power point files are shared. Power point slides are converted to an image format and scaled to either 704*528 or 480*360 pixels. But, participants do not have an option to choose either size. Once the size is set, no resizing or zooming is allowed. A snapshot of a rectangular area (704*528 pixels) on the screen can be inserted into the slide set. Annotation tools can be used to add annotations to a Snapshot slide. Since PlaceWare has fixed size images, annotations work quite well. When given the permission attendee can also annotate on the slides. GIF or JPEG images are best shown as a Web Page slide. A Web Page slide supports any size image without rescaling or color remapping. However, unlike a PowerPoint image slide, annotations cannot be added to a Web Page slide. (Optional) Before uploading a slide set, a .ppt file can be manually exported to generate a .pwp file. So the resultant .pwp file can be uploaded instead of .ppt file and this saves time. Since during uploading .ppt files are automatically exported to .pwp files. Also this saves time if a large slide set is to be uploaded to many different places in the Conference Center. The PlaceWare Add-in for PowerPoint was programmed in VBA (Visual Basic for Applications). VBA programs run within PowerPoint and are tightly coupled to it. PowerPoint also has a COM (Complex Object Model) Automation interface. So PowerPoint can be automated from external programs, mainly Visual Basic, C++, and Java (using the Microsoft JVM). 4. Shared display: Shared display is achieved by using the live demo facility of PlaceWare. The person who is doing live demo (it can be the presenter or someone from audience if given the permission) can broadcast a selected rectangular region of his screen (size is not fixed). There can be anything on that selected area. The images of the selected area are transmitted to clients regularly. Annotations are not allowed with live demo slides. Remote Control: PlaceWare does not provide a way to pass the control of an application to a remote user. 5. Shared Web Browsers: PlaceWare has a web slide. But it is nothing much useful. It does not provide a synchronized web tour. It only allows inserting a web page as a slide into the presentation. When web slide is shown to audience, a browser is started in every client machine with the provided URL. And that�s it. Nothing more is supported. If the presenter scrolls down, no one sees what he is doing, or if the presenter clicks to a link, nothing happens at client machines. Annotation is not allowed on web slides. 6. Archive: The Recording option is only available to those users who selected Recording as part of their Conference Center features. By selecting the Record Presentation feature, a part of a presentation or all of a presentation can be recorded. When this feature is selected, all slides, and any typed information added during the presentation, such as questions, comments, presenter notes, and text typed on Editable Text slides, is included in the saved presentation. In addition to that the audio from a teleconferencing call that occurs during the presentation can be recorded. A recorded presentation can be published as an HTML file containing nonstreaming audio with links to audio files, RealAudio, or Microsoft Netshow. The voice is replayed by real audio player or windows media player and the slides are shown on a web browser as .gif files synchronously. No annotation is replayed. The questions & answers are provided at the bottom of gif slides. On the other hand, if the presenter inserts a whiteboard and saves it during the presentation, then it can be archived. But the events are not archived, only static images can be shown during the play back. Poll results can be saved and showed during play back. 7. White Board: PlaceWare suppoorts White Board slides. They can be generated ahead of time by inserting a blank PowerPoint slide, or during the presentation using the White Board (Draw) Create New Slide button. 8. Chat room/ Instant Messenger: Placeware auditorium enables members seated in a row talk among themselves through text or live-audio chat. He can also join an audience row and interact with audience members. He can have a private conversation with a person in his row. Somebody may have multiple private conversations occurring at the same time with different individuals. If he doesn�t want to see a person�s row chat or participate in 1-1 chats with someone, he can mute the person. Using setup tools audience and presenter chat can be allowed or prevented. i.e. preventing chat in order to make the audience pay attention to the presentation and not talk among themselves. Also if the presenter disallows the audience chat, the audience cannot chat and they will not see audience seating information, such as who is seated in a row or the number of attendees at an event. 9.Quiz/Polling: A Polling slide is a slide to let audience vote. After displaying a slide, the audience votes and the results can be displayed immediately. There may be a list of multiple choices on the slide. Polling slides can be generated ahead of time or during your presentation. Additional 10-person offices: $1,200 per office per year. 1. Capabilities: MeetingPlace is an enterprise communication application for voice and Web-based data conferencing. Users can easily schedule and attend meetings, share and edit documents, and record and access meetings through phones, Web browsers or groupware products such as Microsoft Outlook and Lotus Notes. It integrates with collaborative applications, such as Microsoft NetMeeting and Lotus Sametime and takes advantage of corporate Web, groupware, e-mail, and fax servers. MeetingPlace allows meeting participants to share applications and interact with live documents such as a PowerPoint presentation or an Excel spreadsheet. The data-conferencing is broken down into four components: whiteboard, collaborate, chat, and share. Here are the optional features for MeetingPlace 2000 suite. These features are optional. MeetingTime:� Windows or Macintosh graphical user interface console. MeetingPlace Mobile:� provides wireless Internet access to MeetingPlace, allowing users to schedule and attend meetings from wireless devices. MeetingPlace IP:� extends e-conferencing capabilities to networks for IP base voice and date conferencing. 2. Audio-Video Conferencing: Provides voice and data conferencing with full duplex conference bridging per conference server. There can be 60 simultaneous conferences per conference server. Maximum number of concurrent users in a networked configuration is 960. It supports for IP telephony configurations. 3. Shared Documents of various types: Attachments can be sent to participants via e-mail or fax prior to the meeting. Attachments can be documents, URLs, or voice comments. Documents, comments, or URLs can be posted to participants, who retrieve them via browser or MeetingTime client software It provides on-demand access to documents via fax or e-mail from any phone. Members can share documents in real time with the MeetingPlace Data Conference Option. It broadcasts computer screen content, collaborates on documents and works with Microsoft NetMeeting or other data collaboration software. 4. Application Sharing: Latitude uses NetMeeting to support application sharing. Microsoft is providing tools and enabling technologies, and using third party developers to provide end-user applications. 5. Archive: Conferences can be recorded and be posted on the intranet along with meeting information and documents Members can access recordings via phone, Web browser, or sound-enabled client software. 6. Whiteboard/Chat Room/Instant Messenger: Integration with standards-based T.120 applications, such as Microsoft NetMeeting, lets users to share and collaborate on documents, whiteboard and chat. 8. Quiz/Polling:There is not enough information about polling. 9. Cost: A typical MeetingPlace system starts at around $100,000 for the software licenses, with the cost of hardware. 10. Number of participants: From 8 to 120 users (more possible) or 60 simultaneous meetings (with up to 960 ports in 8 networked servers). Other services have different requirements. 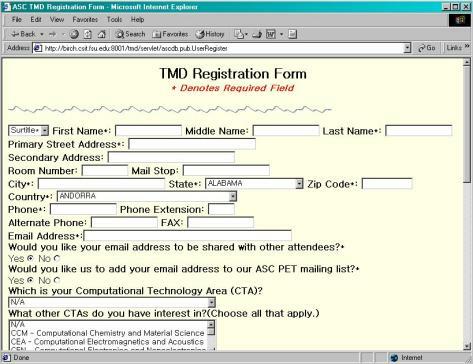 � Java-enabled Web browser (Internet Explorer, Netscape Navigator) to load MeetingPlace WebShare. Any printable document can be shared. Anyone can zoom in or out. Uses vector based image format. Anyone can annotate (no pointer problems). Only Power point slides supported. PPT slides converted to gif images. Any application or entire desktop can be shared. Anyone can share applications given the permission. Presenter or co-presenters can share applications. Shared application can be any size. A selected rectangular area on the desktop is broadcasted to clients. Anyone can do shared display given the permission. It does not provide a synchronized web tour nor does it pass the events such as page down or up. Only points the browsers to a common URL initially. WebEx Recording & Playback enables recording and playback of live sessions. All annotations, shared display and whiteboard discussions are recorded and replayed during the playback. Centra Recorder� lets users to record live sessions and Centra Producer� lets users edit recordings frame-by-frame. We did not test any of these. Voice played back either using Real Player or Windows Media Player and content is shown on the browser as gif images synchronously. Gif images are static and no movement is played back. Java-enabled browser. Automatic installation of client when accessed for the first time. Java-enabled browser for Centra Conference. Separate client for Centra Symposium. 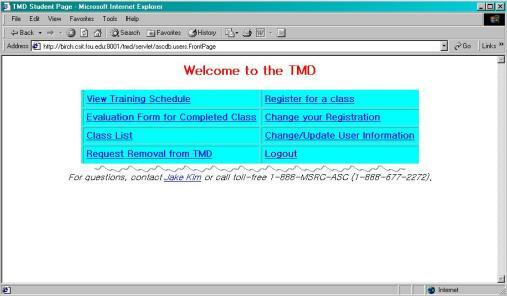 - Java-enabled Web browser (Internet Explorer, Netscape Navigator) to load MeetingPlace WebShare. *Integration with standards-based T.120 applications, such as Microsoft NetMeeting, lets users to share and collaborate on documents, whiteboard and chat. 1. Capabilities: NetMeeting application needs to be installed on your machine. You can download it from the website http://www.microsoft.com/windows/netmeeting/. -Participants can share programs, transfer files, collaborate on the Whiteboard, and use a text-based Chat feature. -NetMeeting can be configured to preserve network bandwidth and implement or restrict features. The presentation feature of NetMeeting is not as powerful as other tools such as Centra or WebEx. You can use �program sharing� feature for presentation. But you cannot do any marking or highlighting unless the shared program allows you to do those. The audio feature is also not enough for presentation. Only two people can speak or listen each other during the presentation. Third person cannot hear or speak to other people. In order to have audio available for more than two participants at a time you must use a Multipoint Control Unit (MCU) server. Unlike audio, all participants can share data. Presenter can take the full control over meeting by selecting the options when creating a meeting.� Second, the presenter does not select any option to take control. Therefore, audiences have the full control over presentation. The highest priority for bandwidth is given to the audio stream, followed by data stream and then the video system. 3. Shared Documents Of Various Types. It does not have this feature. It only allows you to share applications. Sharing capability allows you to share multiple programs simultaneously. Remote Desktop Sharing lets you operate a computer from a remote location. File transfer lets you send one or more files in the background during a NetMeeting conference. It does not have this feature. The whiteboard lets you collaborate in real time with others via graphic information. Chat lets you conduct real-time conversations via text, with as many people as you like. NetMeeting is a free product. If all the participants call the same computer then the maximum number is eight. But you can do chain topology to connect more people. Basically, you could have eight people hooked onto the host and then eight people hooked onto each of those and so forth. The following are the minimum system requirements to install and run Microsoft NetMeeting. 28,800 bps or faster modem, integrated services digital network (ISDN), or local area network (LAN) connection (a fast Internet connection works best). 4 MB of free hard disk space (an additional 10 MB is needed during installation only to accommodate the initial setup files). Sound card with microphone and speakers (required for audio support). Video capture card or camera that provides a Video for Windows capture driver (required for video support). The highest priority is given to the audio stream, followed by data stream and then the video system. Low-bandwidth codecs is used by default (6.4 Kbps). Higher bandwidth codecs can be selected manually. Video �������� performance can dynamically scale higher or lower according to the available bandwidth. I think they need to improve their presentation tools. Presentation is not good as other tools such as Centra or WebEx. Shared export: Files are converted to some image format, uploaded to the server and transmitted to all participants. For the rest of the time, only events are transmitted to the audience, such as, go back one slide, draw a line from (x1, y1) to (x2, y2) etc. Shared Display: The images of shared application are transmitted to the clients regularly. But only the changing portion of the bitmap is transmitted to be efficient. Different techniques can be used to get the best performance. Remote control: Passing the control of an application to a client from the presenter. Although the application is running on presenter machine, a remote client controls it. Shared Web Browsers: An instance of web browser runs in every client�s machine and only events are transmitted from presenter�s machine to the clients such as, go to this URL. Web pages can be shared using shared display, but this would be slower and less efficient, since there is image transferring among remote clients regularly. The only problem with the �Shared Web Browsers� is that web browsers do not have a good event mechanism; they do not report every event to a subscribed application. While the demand for qualified and educated professionals is high in society, traditional teaching techniques look like they are not capable of satisfying this demand. Not to replace, but to fasten the learning process, learning management systems (LMS) are being developed by different vendors in computer software industry. These systems are on-line guided learning environments through which learners are encouraged to self-study curriculum content as well as given necessary tools to collaborate other learners and instructors. In addition, LMSs support educators with assessment tools and databases to keep learners' performance ascending. and an advanced architecture allowing easy integration of multiple administrative systems. URL to find out about it: Blackboard products can be found at http://www.blackboard.com. Blackboard 5 is a learning management system that provides course, course content, user and portal management services. All the users of the system can access information using Web browsers after authenticating themselves with a login and a password pair. Instructors and students first see their list of courses either teaching or taking. After selecting a course, users are provided a navigation menu, which is the same menu shared by instructors and students except a button for the Control Panel through which instructors have the ability to create course content, and alter system, portal, or students� usage settings. Blackboard is mainly or concentrated on an asynchronous teaching environment. Any document can be either uploaded into a shared file area, or submitted through a form with text areas to be posted inside the course content. The latter must be plain text or HTML content. Besides online document sharing, it provides discussion boards, e-mail tools, and a home page preparing wizard as well. 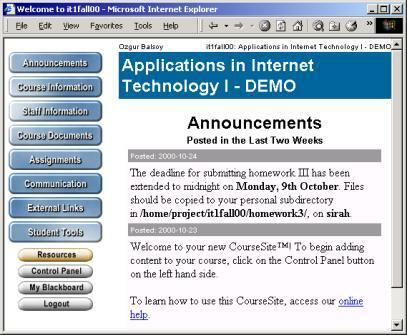 Blackboard environment provides a third-party software, Tutornet Classroom from www.tutornet.com, which enables synchronous teaching. This software has very limited features including a whiteboard, image or Web page sharing on the board, a chat tool, and a question & answer history box. 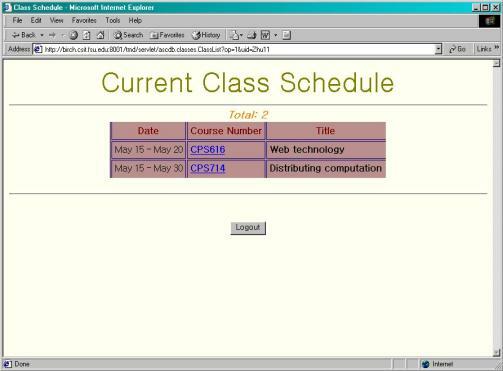 Blackboard also provides users a calendar, the instructors� being the master. This means that students can update their calendar while they can also see the additions instructors make. For instructors, the Control Panel is the major tool through which they can develop course content as well as prepare assessments, post announcements, and alter system and user settings. Portal manager is also very useful feature. Instructors set up the sources, which feed information to the portal such as news sources and search tools. Any related Web content can be indexed into a nice and handy page. � Level One - Course Manager. At this level, the software costs $5,000, and it is available for download from Blackboard�s Web site. � Level Two - Course & Portal Manager. At this level, Blackboard ships the software on CDs by mail. If preferred, the hardware can also be purchased from Blackboard through partnerships with PC companies. In this case, the software is installed by Blackboard, and the system is shipped and it is ready to go. If the Dell Server option is chosen, in this case, the hardware is shipped by Dell, and software by Blackboard. A Dell representative visits the site, and handles the installations, etc. The price at this level is $25,000. � Level Three - Advanced Course & Portal Manager. Installation options are the same at this level as the level two. However, the price is $50,000 plus service costs. Since this level requires on-site customization, and integration with enterprise systems, Blackboard technical support personal have to visit the site and perform the installation. The cost of this service starts from $50,000, up to $100,000. Level one. One top-line system with at least 512MB memory and 10GB hard drive. At this level, the software and database can coexist on the same system. Level two. Two separate systems, one for the software and one for the database. Level there. Two separate systems, one for the software and one for the database. Both systems are recommended to have dual processors with at least 1GB memory and 30 GB hard drive. Blackboard provides Basic Technical Support to the all Level One customers. This includes free administrative and instructor support during the daytime on weekdays, and limited hours during the weekend. Premium Technical Support includes Basic Support, and covers an additional 90 days of support 24 hours a day 7 days a week (24/7). Elite Support provides the 24/7 support during the life time of the software license. I was not able to download and test the software locally. However, Blackboard runs the software at the company�s site for public use. The software looks very easy to use, and has many features, such as discussion boards, class- or group-wise file and message sharing, assessment tool, needed for an asynchronous learning system. On the other hand, the synchronous teaching tools are disappointing. The system can be used for content delivery and assessments. I believe that at this level, there is not any interesting and new feature we would be interested in, and borrow. Content delivery is based on either HTML pages, links to uploaded files, or external pages. Portal environment is also a nice feature. It is customized for each course rather than for individuals. I got some ideas from the data integration architecture to implement in our Grading System. 2. It provides a set of educational tools to facilitate learning, communication and collaboration. 3. It provides a set of administrative tools to assist the instructor in the process of management and continuous improvement of the course. URL to find out about it: http://www.webct.com. Student Tips���������������� Receive a "tip of the day"
These price list is an old price list, the company does not publish their prices today. Training prices are being published on the following address, I did not included them for not having a very long report. NOTE: Although Windows NT is also included in the list officially, in real life, NT suffers a lot in performance. For this reason, Syracuse University, IST Department changed its platform from NT, to Linux. This made a big difference. There is 24 hour support for customers, with additional price. 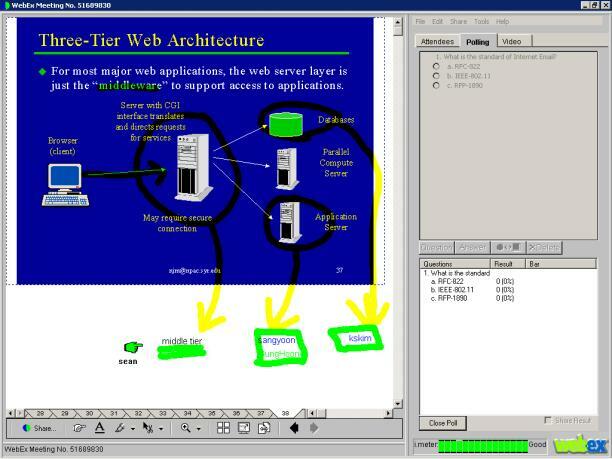 I installed both for Syracuse University (with the administrator of this system) on Linux and in my home on Windows NT. A Unix (that is Linux) Administrator can easily install this software. To install it on NT even very easy. To develop the content for any course, also, does not need sophisticated knowledge. One can learn it very easily. Even there is available many courses in this aspect. But, with respect to te ease of use and learning, the system forces you into some predefined pattern. You don�t have so much freedom. If you don�t need so much freedom and flexibility, the ease of use will charm you a lot. HearMe is a voice over IP application to do voice conferencing. It provides full-duplex voice communication among participants. Today, there are three solutions for teleconferencing: First one is to use Internet as a medium. People attend conferences by using PCs. Second one is to use phone lines and phones. This type of conference is arranged by telephone companies. Third one is to use both Internet and phone lines as a medium. In this case people can attend conferences either by using PCs or phones. HearMe system is based on the third solution. Although using only Internet for teleconferencing is cheap, the quality of voice is not satisfactory. On the other hand, the quality of voice is excellent when phone lines are used. However using phones is unaffordable for many people. Third solution combines the quality of phone lines and low cost of Internet. The idea is that the speaker will talk on the phone providing better voice quality and listeners can either use phones or PCs. In addition to its cost benefits this solution is also more convenient than the other two solutions. A phone-to-PC gateway is used to connect phone lines to Internet. HearMe provides two types of conferences, standard and moderated. In a standard conference, everyone has the same privileges. Anyone can talk at any time. On the other hand, in a moderated conference there are three types of users, moderator, panelist and participant. Moderator is the one who has full control over the conference. He gives the permission to talk and he has the right to eject a participant from the conference and etc. Panelist has right to talk by default. Participant needs permission to talk. HearMe provides a recording mechanism for live sessions. But unfortunately right now they do not provide any tool to replay recorded conferences. Recorded conferences are in HearMe proprietary format and one needs to write its own decoder to replay it. There are three servers, talkserver, MCU, and bridgeserver. Talkserver is used to manage the conferences such as creating a conference, destroying a conference, getting information about a conference etc. Talkserver is basically used by administrators. MCU(Multi-point control unit) is the one who does the real job, getting voice packages from different people and transmitting them to appropriate recipients. In addition MCU can record the conferences. Users directly connect to the MCU. 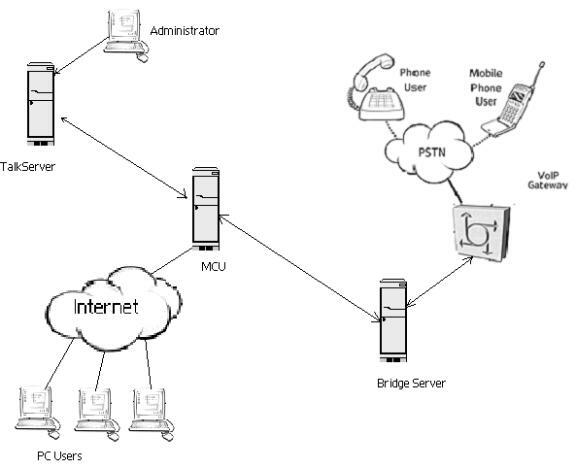 Bridge server and an IP gateway is used to include phone connections into conferences. Gateway converts analog voice signals to digital form and vice versa. Bridge server is used as a bridge between the gateway and the MCU. 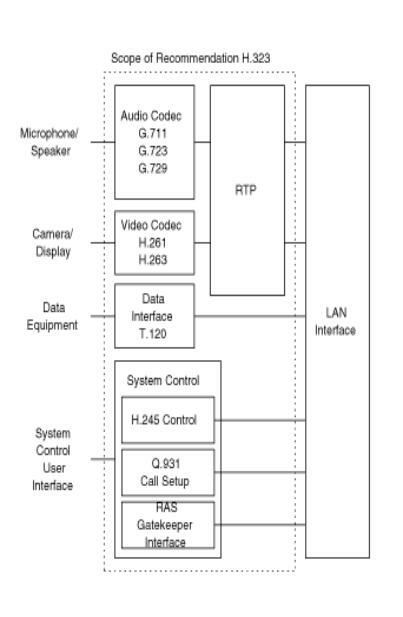 Figure 1: the architecture of HearMe voice over IP system. HearMe uses industry standards in their voice over IP system. Their system architecture is based on the H.323 standard described in section 12 that is a recommendation from International Telecommunication Union (ITU). It sets standards for multimedia communications over Networks that do not provide quality of service. It sets standards for voice, video and data. HearMe currently uses G.723.1 for voice compression. G.723.1 is also a recommendation of ITU and widely used for Internet telephony and web conferencing. They are also using ITU G.711 for voice compression which provides better voice quality and requires higher bandwidth, but it is currently not fully functional. In addition HearMe uses session initiation protocol (SIP) to initiate sessions. Each client needs 28.8 Kbps or greater Internet connection. Server software for TalkServer, MCU and BridgeServer. License files to allow service for up to 16 concurrent customers. HearMe provides a solution for the voice conferencing over the Internet and it also allows telephone users to attend these conferences. It is relatively cheap and high quality compared to other solutions existed on the market today. Although they lack some features like replaying recorded conferences, they are on the right track and they will add those features in future releases. 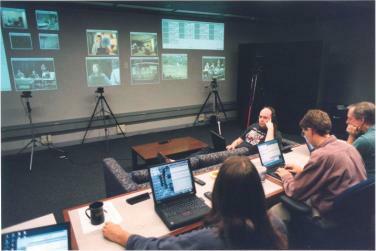 The Access Grid, designed in Argonne National Laboratories, is a system that enables group-to-group collaboration across Internet by providing multiple video and audio streams among groups. The Access Grid consists of many AG nodes around the country. AG node is a special room designed to participate in AG meetings.� It consists of video cameras, projectors, audio equipment, computing equipment and high-speed Internet connection. There are currently around 30 AG nodes in US. 20 more institutions are planning to install it soon. The access grid project focus is to enable groups of people to interact with grid resources and to use the grid technology to support group-to-group collaboration at a distance. This is the main difference between desktop-based collaboration tools and the AG.�� The AG is designed in a way to give sense of presence to remote participants. AG nodes have large displays, multiple video and audio streams. Audio system is designed in a way that every participant can talk hands free. 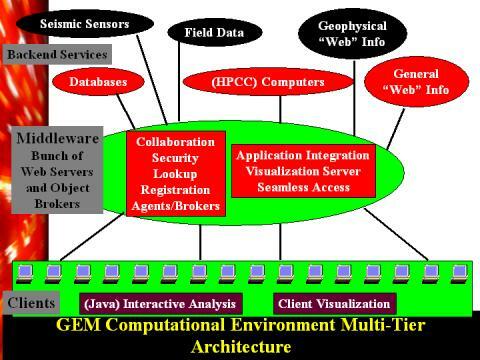 There are four computers, display computer, video capture computer, audio capture computer and control computer, in each AG node. Video capture computer is used to get the video streams from the cameras in the room. It has fours video capture cards on it and runs Linux operating system. Audio capture computer gets audio streams from the microphones in the room and encodes and broadcasts them to other nodes. It also gets audio streams from remote nodes and decodes them. It runs Linux operating system. Control computer is used to run control software for the audio gear(echo canceller). It runs windows 98 operating system. Access Grid partners have developed several pieces of software. One of them is a multicast beacon that is used to monitor the network status of nodes. Another one is distributed power point tool that is used to share power point slides in a session.�� Persistence and scope are provided by using the Virtual Venue software developed at Argonne. It� has components that run on the Display, Video, and Audio machines, as well as a central server. 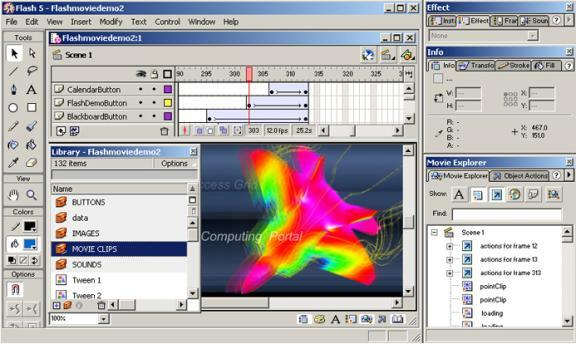 VIC is another software that is used to manage displays.� RAT software is used to manage audio. The Access Grid uses Robust Audio Tool (RAT), an open source software, for handling audio. It is an audio conferencing and streaming application that allows users to participate in audio conferences over Internet. RAT is based on IETF standards and uses RTP above UDP/IP as its transport protocol. RAT features a range of different rate and quality codecs, G.711(64kb/s), Wide-Band ADPCM(64kb/s), G.726 ADPCM (16-40kb/s), DVI ADPCM (32kb/s), Variate Rate DVI ADPCM (~32kb/s), Full Rate GSM (13kb/s), LPC (5.6kb/s). It also features encryption so you can keep your conversations private. 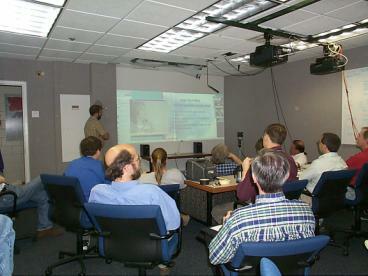 The Access Grid uses Video Conferencing Tool (VIC) for handling video. VIC is a real-time, multimedia application for video conferencing over the Internet. It is developed by Network Research Group at the Lawrence Berkeley National Laboratory in collaboration with the University of California, Berkeley. VIC is based on Real Time Transport Protocol (RTP) developed by IETF. To be able to use conferencing capabilities of VIC, your system should support IP multicast. VIC uses H.261 protocol to encode and decode video streams. H.261 is the protocol that defines the video portion of H.323. Argonne has built a recording and playback engine, Voyager Multimedia Multistream, that can record and playback live sessions. It saves multiple video and audio streams to disks without loss. It also synchronizes in time the multiple audio and video streams when playing back. These prices and equipment may vary depending on the configuration of the AG node. Access Grid software is free. Today the group-to-group collaboration is a need in many areas and it is not easy to gather everyone to the same place. Access Grid is trying to make this happen in remote locations by providing real life size images and hands free audio. They are quite successful on this and the number of institutions that are installing the Access Grid is increasing rapidly. The WebEx is one of the collaboration services provides a range of real-time communications services. WebEx provides Web meeting, sharing documents, sharing applications, giving real presentation, and various environment for collaboration work. The Virtual Network Computing is, in essence, a remote display system which allows users to view a computing 'desktop' environment not only on the machine where it is running, but from anywhere on the Internet and from a wide variety of machine architectures. These two systems have different goal of development. The WebEx is developed for providing the environment of collaboration work for business. And VNC is the system for sharing display and application between different machines. 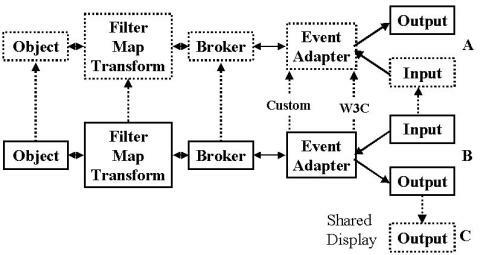 However, both of systems provide shared display, export, shared event control in common. Nevertheless, the techniques used in both systems are different. This evaluation compares and evaluates the shared display in WebEx and VNC. No state is stored at the viewer. This means you can leave your desk, go to another machine, reconnect to your desktop and finish your job. Small and simple. The Win32 viewer, for example, is about 150K in size and can be run directly from a floppy. There is no installation needed. Platform-independent. A desktop running on a Linux machine may be displayed on a PC, PDA. Or a Solaris machine. Or any number of other architectures. There is a Java viewer, which will run in any Java-capable browser. Sharable. One desktop can be displayed and used by several viewers at once, allowing CSCW-style applications. Free! It is downloadable. Both binaries and source code are available from http://www.uk.research.att.com/vnc , along with a complete copy of� documentation. Text and graphics are sent in a vector format (i.e. drawing primitives lines, rectangle, text, etc.) and not as bitmaps. This produces high quality images and also drastically reduces the size of the data. reduces network traffic it also adds a level of �encryption� to the data stream. During application sharing the contents of the window are dynamic. WebEx�� MeetingCenter incrementally updates only those portions of the screen that have changed. Furthermore the updates are transmitted as vector graphics commands and not as bit maps. Several video compression and optimizations have been incorporated into meeting center. The data stream produced by video transmission is directly related to the rate of change of the video. The shared display of the WebEx is based on real-time multi-point data communication.� It is following industry standard, T.120.WebEx has optimal protocol. WebEx MeetingCenter is able to work through all firewalls using the HTTP protocol. However, it first checks to see if communication can be established using the lower level TCP protocol. This is more efficient and reduces network traffic. Using the TCP protocol reduces network traffic by about 10% when compared to HTTP. Since the bitmap is easy to handle on the various platforms, all images from the VNC server are in bitmaps.The VNC simply works with a server to update the framebuffer displayed on a viewer. Because it works at the framebuffer level it is potentially applicable to all operating systems, windowing systems and applications. �When the VNC client or server is sharing the contents of the window or events VNC incrementally updates only those portions of the screen that have changed.VNC has a variety of different encoding schemes for the pixel data, and it can select the appropriate scheme for each rectangle the server sends, and make the most of network bandwidth, client drawing speed and server processing speed. The input side of the protocol is based on a standard workstation model of a keyboard and multi-button pointing device. Input events are sent to the server by the client whenever the user presses a key or pointer button, or whenever the pointing device is moved. These input events can also be synthesised from other non-standard I/O devices. The VNC operates over any reliable transport such as TCP/IP, and it is basically point-to-point network. Each client uses differnet number of port and each platform is accessed via pre-defined port. Thus, the server should open the connection for each client and send image even if they are all same images. Technically, the Instant messenger is based on the Mail protocol (SMTP, POP3) to send and receive text between two or more user in the virtual real time. The message is sending through Port 25 using SMTP Protocol and receiving through 110, POP3 Protocol. Even though it uses current Email protocol, the Instant messenger program monitor the mail server (In most case, Service Providers Mail server e.g. Yahoo server, MSN server, AOL server. Because of that, people have to have an ID) and deliver the message right after user type the message). The Group Chat function makes sense when we treat it as similar one with Cc or Bcc in Email header. But to provide more functionality, more Protocol needed. When Instant messenger user asks WEB information, the HTTP request will send out and receive through Port 80.� UDP Port 13223 should be open for the Voice Chat and PC to phone features. Common features: Instant message, Group Chat, and send email to off-line user/no-account user. MSN: Has a page service rather than having a Mobile phone version of messenger. Instant calling within US is enable by Net2Phone. Most of Firewalls block UDP port, which is used while using Internet-phone. Yahoo: Has several different platform versions, such as Windows, MacIntosh, UNIX/LINUX, WinCE, PalmOS, and Mobile Phone. Mobile Phone and PalmOS version enable us to get the Instant Message on the move by Wireless Service. Internet-phone calling. Jabber: Has Interoperability with AOL Instant Messenger and ICQ and will equipped with Yahoo/MSN transport soon. This IM platform is XML based, open protocol and modular/extensible architecture. Pentium workstation with 256 or 512 megs of RAM running Linux. Yahoo has several different version of Instant Messenger Service. Different versions are covering most of platforms including PalmOS and Mobile phone. What Yahoo Instant Messenger has are Windows (definitely), Mac, Linux, PalmOS, WindowsCE and Mobile phone. Most interesting version for us is version for PalmOS. Since it is enable us to use the Instant Messenger Service without limitation of space and location. Palm version requires Browser (such as AvantGo, Proxiweb, or pdqBrowser for pdQ smartphone) as well as Palm device and communication method, which are in most case Wired/Wireless Modem and Internet Service Provider (ISP). What Browser do in IM (Instant Messeger) is that Yahoo IM receives message text and other Information as HTML type and browser spread it on the Palm screen. Current Yahoo IM is .prc file like other Palm program and working closely with Browser, but it will be possible to have a Java version (Actually, KVM version). Yahoo messenger is most versatile messenger among all. Its diverse versions help users be anywhere and any machine, while MSN messenger service has Windows and Mac version. 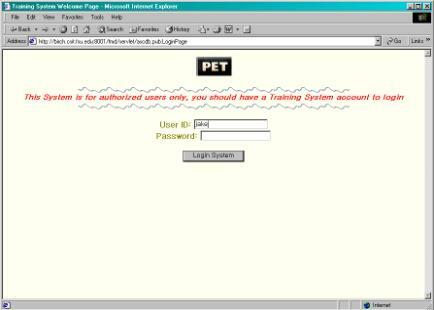 The Instant Message test between Windows version and PalmOS version is very much successful. User Interface is neat and attractive and sending and receiving the message is quick enough to be called �Instant�. The mobile version is partly related with desktop version. You need to set up your login and friend list on the desktop. One of the convenient features of Mobile Messenger Service is to provide Quick Message from the menu. MSN is more focus on stability and popularity. 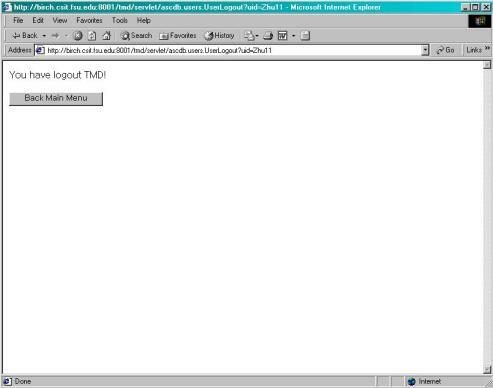 The user who has account at MSN and hotmail.com can directly login without another sign-in process. Jabber makes itself little different with others, since it release open source platform and make it possible to build independent IM service. PowWow, which was interoperable Instant Messenger service with all major service (AIM, MSN, Yahoo and ICQ), is temporary out of service and Trillion can be the less powerful (Only support Chat) substitute. Interoperate and schedule with other open standards-based calendaring systems. Choose the calendaring client they would like to use regardless of their calendaring server software. Integrate desktop applications with each other and with handheld or portable devices. Today, the most productive of the numerous past calendaring and scheduling standards efforts can be found in the Calendaring and Scheduling (calsch) working group of the Internet Engineering Task Force (IETF). The IETF is responsible for developing Internet Standards. The charter and work of the calsch working group can be reviewed by visiting the IETF web site. vCalendar/iCalendar are data formats that communicate calendaring information between applications such as personal information managers, group calendaring systems, word processors and web browsers. Including these formats in your mail allows its recipients to store and display the information easily with their preferred calendaring software (if it supports these formats). vCalendar is the older of the formats and is currently supported by many products. iCalendar is a newer and more robust version of vCalendar that is capable of transferring more information. iCalendar Transport-Independent Interoperability Protocol (iTIP) specifies how calendaring systems use iCalendar objects to interoperate with other calendar systems. Internet E-mail Interoperability Protocol (iMPI) defines how encapsulated event data will be sent through the mail. iCalendar Realtime Interoperability Protocol (iRIP) enables realtime interoperability between calendaring and scheduling clients and servers using the iCalendar format for information exchange. The Calendar Access Protocol (CAP) is an Internet protocol for accessing an iCalendar-based calendar store from a calendar client application. It will give users the ability to �mix and match� different calendaring and scheduling clients and service. The best that any calendar software implementers can do at the moment is implementing the following protocols: vCalendar, iCalendar, SMTP (for e-mail notification) and LDAP (for details of all users, groups environments). Currently following products support one or more above technologies for calendaring. Corporate Time is an enterprise calendaring and scheduling system. It can both import and export vCalendar/iCalendar objects and integrates with other vCalendar/iCalendar programs. CorporateTime Server combines user agendas together into a central schedule, located in the server database. All the meetings, events and notes your users create are stored in this database, allowing other users to access the information immediately.� It also supports PDA synchronization including Palm, Win CE and Psion. The iPlanet Calendar Server, from the Sun-Netscape Alliance, is a server-based tool that provides the larger corporation with a real-time scheduling and collaboration solution. It provides a highly scalable and reliable Web-based solution for centralized calendaring and scheduling, with the capability of supporting hundreds of thousands of users per CPU. Netscape Calendar, part of Netscape Communicator 4 Professional Edition, supports import and export of events in vCalendar format though text files and through the Clipboard. Communicator with Enterprise Calendaring is the full-featured client for Calendar Server. Users with Communicator with Enterprise Calendaring can set up and designate permissions and manage other users' calendars. Communicator with Enterprise Calendaring also provides sophisticated printing and group management capabilities, and users of Communicator with Enterprise Calendaring can enjoy the performance and user interface of their native desktop environment - Windows 3.1, 95, NT; the Mac OS; Linux; or Unix. Communicator with Enterprise Calendaring includes a component that allows users of the PalmPilot to synchronize its calendar with Netscape Calendar but not with Win CE and outlook. 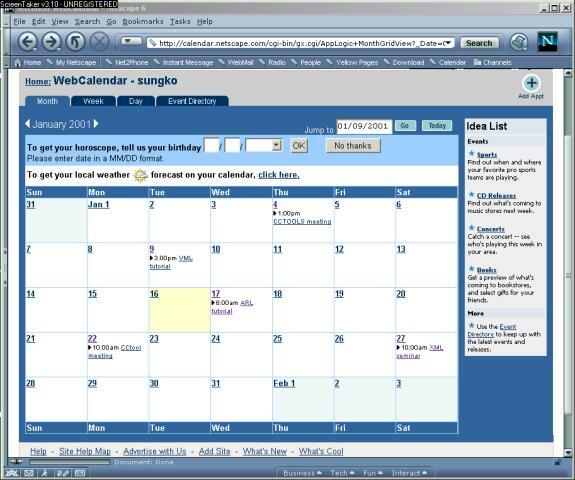 A picture of Netscape Calendar. Training Management Database (TMD) is a web-based training system for course administration, which is originally developed by a former NPAC research scientist Ms. Zhu. It provides users with web interfaces to access course information in database, input new course and users information into database and administrate course/user information. The main functions include system administration, new course/class session creation, new system user creation, instructor registration, new user registration and input. It has access control in which includes user level and administrator level accesses. The system is developed using pure Java, so it�s portable. It implemented using JDBC, Java Servlets, HTTP Server and JavaMail. The backend is RMDB Oracle8 with JDBC thin Driver. JavaMail uses the JavaBeans Activation Framework (JAF) in order to encapsulate message data and to handle commands intended to interact with that data. Interaction with message data should take place via JAF-aware JavaBeans, which are not provided by the JavaMail API. A user account can only access the user�s related functions like �View Training Schedule,� �Evaluation Form for Completed Class,� "Class List," "Request Removal from TMD," "Register for a class," "Change your Registration," "Change/Update User Information," and "Logout." An administrator account has additional control functions of all the classes and other users. They are �Class Information Form,� "Post a Class," "Verify New User," "Change/Update Posted Class," "Append the Catalog," and "Verify Class/Course." As the menu infer, functions are for class matters as class schedule, registration, change, evaluation, and list. A user can change his/her information and request account removal to administrators. 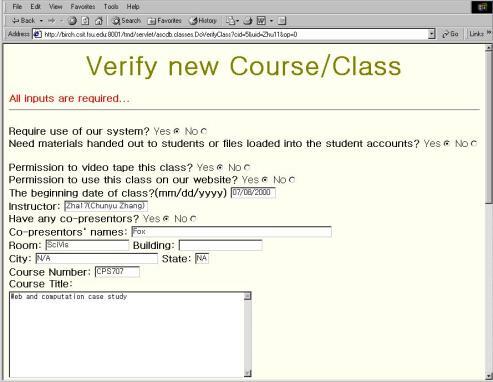 Administrators manage the classes and users. They make and update classes and users on the Training Management Database. Charon: authenticates the user to WebFlow server and provides a secure channel for HTTP requests and responses. 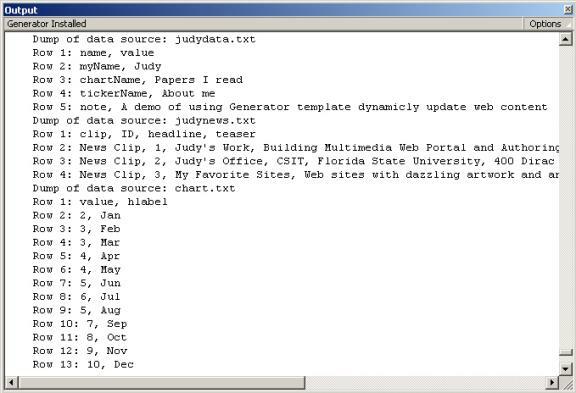 ContextManager: manages user session (state) information, allowing users to revisit previous sessions. FileBrowser: provides methods for accessing and manipulating files on the server. SubmitJob: provides methods for submitting jobs and executing system commands on the backend systems. Users can select applications and platforms for running commodity codes. Users create job scripts via form interfaces. Job scripts for the appropriate queuing system are generated automatically. Users can upload and download multiple files, submit jobs, and monitor execution via graphical interfaces. Administrators have access to an installation wizard that allows them to manage and verify information about the applications that they wish to make available to users. Gateway is a system-centric portal, providing tools that simplify running codes in different environments and on different HPC platforms.� It is designed to work with applications for which the source code is not available.� It further makes the assumption that the codes have already been parallelized. This design is influenced by the funding entities (ASC and ARL MSRC), which make extensive use of commercial codes and have a separate effort (CHSSI) for parallelizing codes.� Gateway concentrates instead on providing a uniform interface for scientist who use the facilities of multiple centers with different access policies.� Gateway helps users submit jobs to different queuing systems, tracks running jobs on many different hosts, and provides tools transferring files between the user�s desktop and the remote system.� As a system-centric portal, it is compatible with and complementary to code-centric portals such as Cactus. Gateway front end software is in developmental phase and is not yet available for download.� Middle tier (WebFlow) source code is available for download from the Gateway web site. Cactus is designed to be object-oriented and extensible.� The core of the code is called the flesh, and extensions are referred to as thorns.� The flesh manages program execution.� Users specify runtime parameters and execution in special input files.� This is dynamic, so users can change parameters and the execution schedule of various parts of the code during runtime. � HDF5 Toolkit: contains thorns needed for I/O using the HDF5 data format. � PETSc Toolkit: thorns for interacting with the PETSc library for solving elliptic equations. � Benchmarking Toolkit: provides a benchmarking application (solver for gravitational waves). � Web Browser Toolkit: provides thorns that act as web servers.� Users steer computations via http requests.� Output streams from running applications can be displayed as jpegs. Cactus was initially developed to support work on large-scale problems in computational numerical relativity.�� A number of specialized thorns are available for solving boundary value and time evolution problems on three-dimensional Cartesian grids.� Interested developers can create their own custom thorns. � A thorn acting as a web server provides access to running applications. � Multiple participants can connect to this server with their browsers.� The session is password protected. � Participants can steer the application by changing input parameter values.� This is an HTTP request layer on top of the core steering capabilities that Cactus provides. � Cactus� checkpointing and I/O functions allow the code to output data as a jpeg stream so that all of the session participants can see the visualized output in their browsers. Note that the collaborative and web-access capabilities are only part of the Cactus project.� Users can use Cactus thorns for parallelization, I/O, and steering independently of the web thorns. Free download with source code. Latest version is 4.0 beta 9. ����������� Flash 5.0 is a vector-based technology that supports animation, sound and interactivity. It evolved from a product �Splash� in the mid 90s and aims at delivering scalable and high quality web content over the Internet. Flash player is a viewer to show Flash content (SWF), which is either generated by the Macromedia Flash authoring tools or exported from other leading designing tools. Flash player is small (about 200K) and quick to automatic download for Windows, Linux, Solaris, Macintosh, IRIX, and Java through most web browsers. User can create Flash content (SWF) with Macromedia authoring software, such as Flash 5, then save and publish the result artwork (including text, graphics, animation, sound objects and attached actions) as flash movie � an editable format (.fla) or a final format (.swf). The former format can be read by Flash and the objects (items on the stage) can be altered. The later is a compact binary format optimized for web delivering, therefore, not editable. Flash file format (.swf) is currently the most widely used vector graphics and animation format on the web. In April 1998, Macromedia announced to make SWF an open source for becoming an Internet standard of vector graphics and animation. In early 2000, the following SDK�s � Macromedia Flash Player source code SDK and Macromedia Flash File Format (SWF) SDK are released for open access (with Source Code License Agreement). The above tools and documentation make Flash Player platform independent and also extend ways for developers to write SWF files. Flash 5 features a user-friendly interface that provides a powerful development tool for creating artwork, streamlining workflow and creating interactivity. ����������� Macromedia has three products for web graphics design � .FreeHand 9, Fireworks 3 and Flash 5. Like Adobe Illustrator 9, FreeHand is used as a powerful tool to create original artwork � vector illustration, layout, bitmap creation, text and image editing, painting and animation. 4Drawing � provides various tools for drawing freeform or precise lines, shapes, and paths, and painting filled objects. 4Type � the text block object where properties such as size, typeface, style, spacing, color and alignment can be set. Sophisticated transform can be applied like shape object. 4Buttons � the objects (with four status: Up, Over, Down and Hit) trap mouse clicks and trigger the interaction with Flash movie. 4Animation � tweening is an essential technique for creating animation. It defines starting and ending states of an instance, group, or text block and use transformation matrix to do the calculation and interpolates the values or shapes for the frames (cells on the Timeline) in between. There are two types of tweened animation in Flash: tweening motion (position and shape) and tweening color. Here is an example of a tweening motion along a straight path (Figure 3). ����������� Vector graphics is perhaps the most important technique used by Flash 5. Although there are other leading designing tools that build up on vector graphics, such as CorelDRAOW 10 graphics suite, Macromedia Flash is the very first one who uses vector based graphic design in generating web contents and delivering them over the Internet. Compared with bitmapped images (GIF and JPEG), which are optimized for a single resolution, the scalability of vector images is more ideal for displaying web contents uniformly on PDA, set-top boxes, or PCs. Vector images can be more compacted, thus make the file size small for delivering. Therefore, the product benefits from this designing feature both in terms of bandwidth efficiency and device independence. ����������� The Macromedia Flash (SWF) file format was designed to deliver vector graphics and animation over the Internet. It features with extensibility (a tagged format), efficiency (a binary format), simplicity (a simple format) and scalability (vector based graphics). SWF structure is consists of a Header and a series of tagged data blocks (Figure 4). There are two types of tag � definition tag (defining the content of a Flash movie) and control tag (manipulating characters and controlling the flow of the movie). 4Change Encoding � SWF files only store the changes between states. 4Reuse � by the character dictionary, a font, bitmap, shape, or button element can be stored once and referenced multiple times. ����������� The dictionary is a repository of characters that have been defined, and are available for use by Control Tags. The structure and interaction between definition tags, control tags and the dictionary is showed in Figure 5. The Macromedia Flash file format (SWF) SDK is a C++ Library that provides a set of tools for developers to write Macromedia Flash (SWF) files. There are two types of interfaces for writing SWF files, a high-level and a low-level manager. Both interfaces are in the same code base, but are used somewhat differently. The high-level manager presents a simple interface for writing SWF files, while the low-level manager presents an API for writing an arbitrary SWF file. 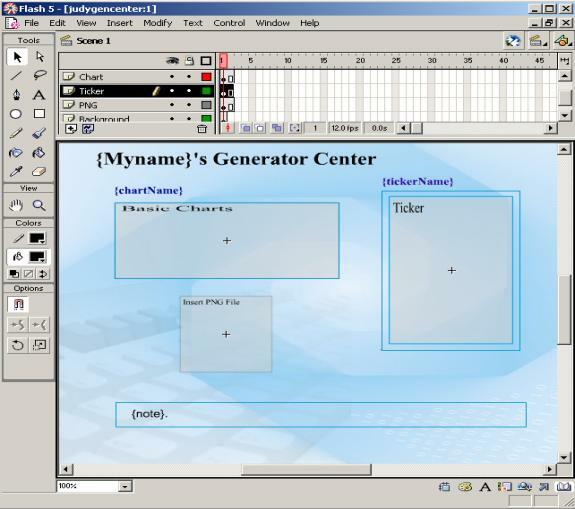 ����������� Generator 2.0 is a Web server production application written primarily in C++. When integrated with Flash, it can dynamically combine variable objects (text, graphics and sound) to build rich media content and deliver the final product over the Internet in animated or static formats. ����������� Template is a container that has variable elements (graphics, text and sound) to be replaced with content provided by a data source (text files and databases etc.). 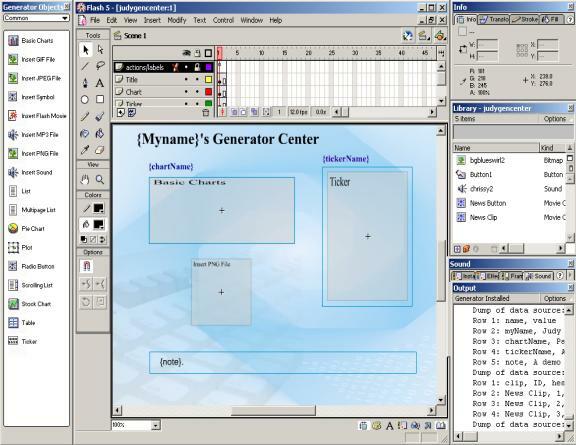 Using template technology, Generator provides the mechanism for designers to create prototypes (.swt) in Flash with Generator authoring extensions (Generator Objects). Generator objects are placeholders for Generator-processed content. The Generator Objects Panel provides some standard objects, such as charts, tables, tickers and lists (Figure 6). ����������� The process of using Generator can be illustrated in the following authoring mode of operation (Figure 7). There are two editions of Generator 2 � the Enterprise Edition and the Developer Edition. They are different in performance, scalability and online production. The Enterprise Edition has more extensive caching technology, which stores frequently requested information. With its own web server on line, it is used for delivering real-time, visual content (Figure 8). It allows developers to extend the functionality by creating their own Generator objects by using the extensive API and Developer�s Kit (SDK). The Developer Edition is a data-driven, automatic updates solution. It processes requests one at a time, therefore, it is only used in offline mode (Figure 9). 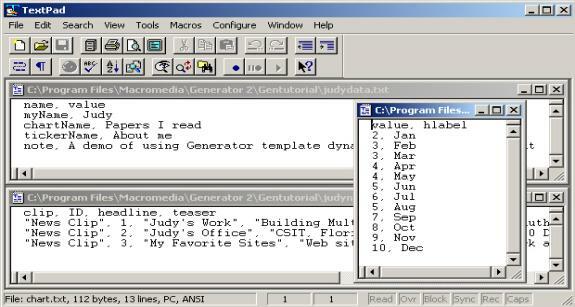 Generator 2 Developer Edition also includes some new objects and an extensible API. ����������� Macromedia Flash 5.0 and Generator 2.0 are powerful tools for designing and delivering web contents. Especially the Vector Graphics and Template technologies that they use bring highlights to the system. However, there are still some insufficient factors in the perspective of view of designing general web authoring tools. For example, dynamic positioning of web contents is a very important feature for automatic batch processing and rendering of the general web authoring system. It is not obvious that Flash and generator provide such interface. Although Macromedia made Flash File Format (SWF) an open standard, being a commercial product, there are still constrains in developing and delivering the customized application that build on top of Flash. ����������� In November 2000, W3C proposed a new version of Scalable Vector Graphics (SVG) Specification. Compared with Flash SWF files (a compact binary file format that requires an additional browser plug-in to be available in order for displaying a movie), SVG is an XML-compliant open standard. The non-proprietary formats of SVG would provide developers a choice of vector graphics and movie formats. A color monitor with resolution 800x600; and a CD-ROM drive. ����������� Netscape 3, Internet Explorer 3.02 or later. ����������� A color monitor with resolution 800x600; and a CD-ROM drive. ����������� 64 MB of RAM, 48 MB available disk space and 64 MB of swap space. ����������� 64 MB of RAM, 80MB available disk space and 128 MB of swap space. ����������� 64 MB of RAM, 80MB of available disk space and 128 MB of swap space. ����������� There are two demos made by using Flash 5.0 and Generator 2.0 to exploit the key functionalities provided. The flowing are snapshots of the demos. H.323 is an umbrella standard designed for multimedia conferencing over IP-based networks. It is a recommendation from the International Telecommunications Union (ITU). H.323v1 was released in 1996 and the latest version 4 was released in Nov 2000. It specifies standards for four areas: audio, video, data and control. Audio signals contain digitized, compressed sound. H.323 supports proven ITU standard audio codec algorithms, including G.711 for speech, which transmits voice at 56 or 64 Kbps. Support for other ITU voice standards (G.722, G.723, G.728, G.729) is optional, since each one reflects tradeoffs between speech quality, bit rate, computing power, and signal delay. Video capabilities are optional. Video-enabled H.323 terminals must support the H.261 codec, with optional support for the H.263 standard. The H.323 recommendation provides optional data streams in conferences. This supports networked collaboration such as whiteboard, application sharing, and file transfer applications. An H.323 system supports data through T.120 capabilities in clients and MCUs. The MCU controls and mixes the data streams. H.323 defines four major components for a multimedia conferencing: Terminals, Gateways, Gatekeepers, and Multipoint Control Units (MCU). Terminals are the client endpoints. Figure 2 describes the components of a terminal. RTP/RTCP support, for sequencing audio and video packets. H.323 terminals can be classified by room and desktop systems. Establish links with remote H.324-compliant terminals over PSTN networks. A multipoint control unit (MCU) supports multipoint conferences between three or more endpoints. As defined by H.323, an MCU consists of a required Multipoint Controller (MC) and optional Multipoint Processors (MP). The MC handles H.245 negotiations between all terminals to determine common capabilities for audio and video processing. The MC does not deal directly with any of the media streams. This is left to the MP, which mixes, switches, and processes audio, video, and/or data bits. MC and MP capabilities can exist in a dedicated component or be part of other H.323 components. H.323 supports centralized, decentralized and hybrid multipoint conferences. Centralized multipoint conference requires the existence of an MCU to facilitate a multipoint conference. All terminals send audio, data, video, and control streams to the MCU in a point-to-point fashion and MCU centrally manages the conference using H.245 control functions that also determines the capabilities of each terminal. The MP does the audio mixing, data distribution, and video switching/mixing functions and sends the resulting streams back to the participating terminals. Decentralized multipoint conferences make use of multicast technology. Participating terminals multicast audio and video to other participating terminals without sending the data to an MCU. Note that control of multipoint data is still centrally processed by the MCU, and H.245 Control channel information is still transmitted in a point-to-point mode to an MC. Receiving terminals are responsible for processing the multiple incoming audio and video streams. Hybrid multipoint conferences use a combination of centralized and decentralized features. H.245 signals and either audio or video stream is processed through point-to-point messages to the MCU. The remaining signal (audio or video) is transmitted to participating terminals through multicast. One advantage of centralized conference is that all terminals support point-to-point communications. No special network capabilities are required. On the other hand, decentralized conferences make more efficient use of network bandwidth, but places higher computational loads on the terminals, which have to mix and switch their own audio/video receiving streams. As far as I know, today H.323 MCU products support only the centralized multipoint conference type. In addition, only point-to-point mode of transportation is supported by today�s H.323 MCUs. H.323 uses both reliable and unreliable communications. Control signals and data require reliable transport because the signals must be received in the order they were sent and can not be lost. Reliable transmission is connection-oriented and it is handled with TCP in the IP stack. On the other hand, audio and video streams lose their value with time. If a packet is delayed, it may have not any relevance to the receiver. Therefore audio and video signals use the more efficient unreliable transport. It is accomplished with UDP in the IP stack. Recording is not supported by H.323. A complementary system should be designed to record the live sessions. H.323 is very complex and uses dynamic ports including multiple UDP streams. An H.323 terminal needs to make many simultaneous connections. At least two of them are TCP and for an audio only conference, it may need up to 4 UDP connections. All connections except one are made to dynamical ports. Calls can be initiated outside the firewall as well as inside the firewall. In addition there are also some issues related to H.245 connections and Q.931 data streams. H.323 proxies are used to allow H.323 streams to go through the firewalls. So, to determine and permit the H.323 streams, a firewall must be H.323 enabled with H.323 proxies. Cisco PIX firewall is one of such firewalls. HearMe uses another solution, when the client behind a firewall, it uses TCP instead of UDP for voice transfer suffering from the performance. Microsoft NetMeeting, WebEx, Intel Proshare that is now acquired by PictureTel, HearMe, Lipstream, PictureTel, Polycom. Intel, Cisco, RADVision, PictureTel, Polycom are some of the companies that promote developing H.323 complaint products. Cisco and RADVision are two of the companies, which sell H.323 MCUs, gateways and gatekeepers. A list of H.323 products and producers can be found at http://www.packetizer.com/iptel/h323/products.html. International Multimedia Telecommunications Union (IMTC) is formed to promote, encourage, and facilitate the development and implementation of interoperable multimedia teleconferencing solutions based on open international standards. H.323 is one of the standards IMTC provides interoperability tests. 12.13 Who doesn�t support H.323? Competing protocols to H.323 are Session Initiation Protocol (SIP) and Media Gateway Control Protocol (MGCP). SIP is a new and more likely competitor. It is developed by IETF. Although they are competitors, they can also work together. For example, HearMe VoIP system is both H.323 and SIP complaint. Here are the advantages of SIP over H.323 from http://www.hut.fi/~tttoivan/index4.html. � IP-based: IP is the dominant protocol both at the edges and in the core of the Internet. As a result, interoperability with ATM and ISDN is not an issue. H.323 carries a lot of extra baggage to make sure that it is interoperable with the other standards in the series. SIP is free of this extra rarely needed luggage. � Less complex: SIP is a much smaller and less complicated standard that is based on the architecture of existing popular protocols such HTTP and FTP. On the other hand, H.323 is large and complicated. As a result, H.323 products and services are more expensive to develop. � Easy to decode/debug: SIP uses a simple format for commands and messages. These are text strings that are easy to decode, and hence, easy to debug. The entire set of messages is also much smaller than in H.323. � Client/server architecture: SIP messages are exchanged between a client and a server like HTTP messages. This client server operation mode allows security and management features to be implemented easily in SIP when compared to H.323 calls. � Easier firewall/proxy design and configuration: SIP commands can easily be proxied and firewalls can be designed to allow/disallow SIP communications. Getting H.323 through firewalls and proxies is much more complicated. � Extendible and scalable: Because SIP is based on a client/server distributed architecture it is more scalable than H.323 which often requires peer-to-peer communications. Extending SIP is also easier because of its simpler message format and greater experience with similar protocols such as HTTP. Some people make an analogy between H.323 and ATM that provide too much too soon. H.323 has more than 4 years of experience, maturity, stability and widespread deployment. On the other hand, SIP is a relatively new protocol. it lacks maturity and widespread deployment. It needs enhancements. But it seems to me that SIP is on the right path. Both of them have advantages and disadvantages. To me it is better to support SIP rather than H.323 given the advantages of SIP above. A device that links three or more point-to-point videoconferencing systems into a multipoint conference.